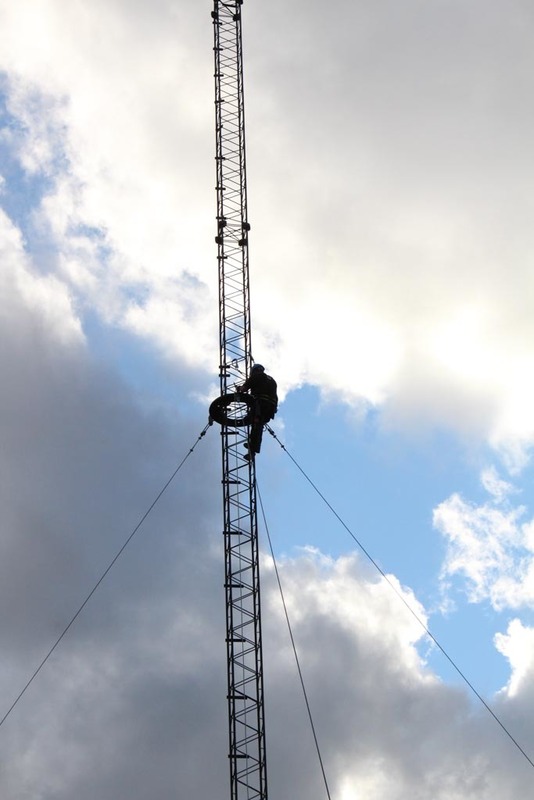 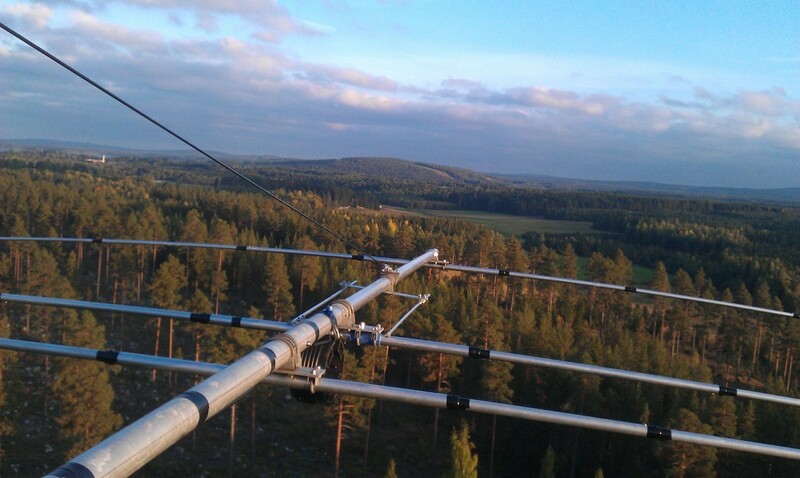 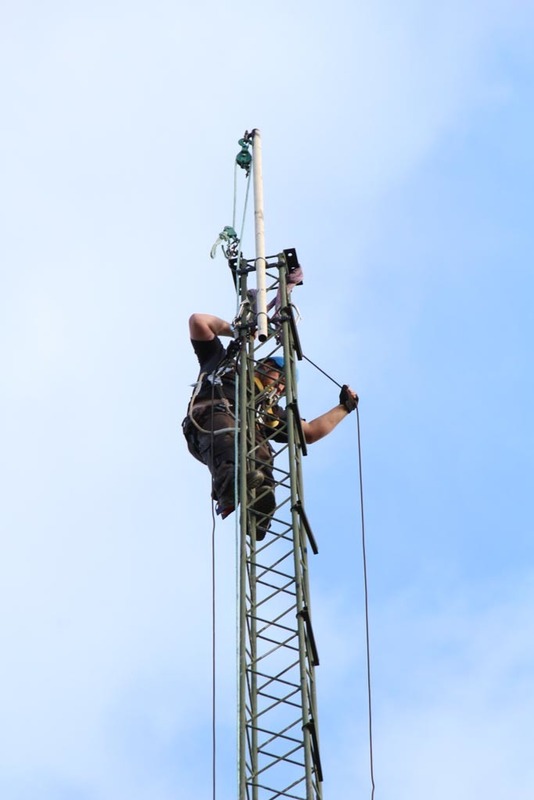 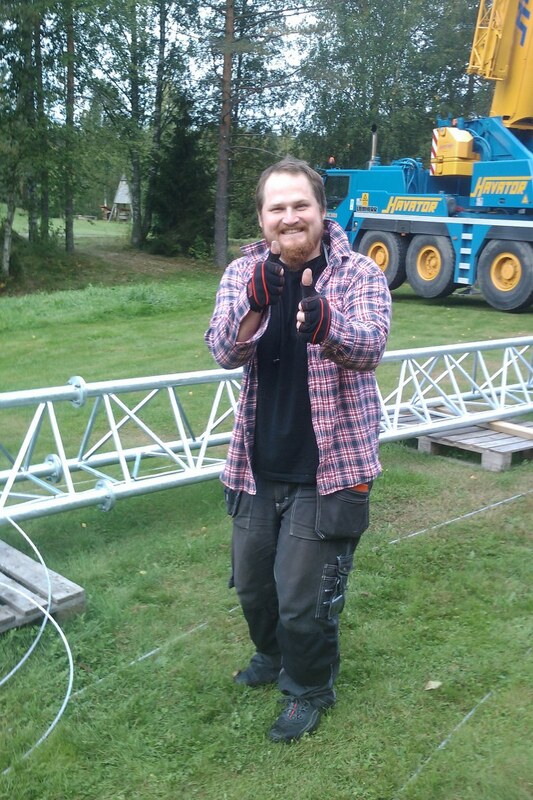 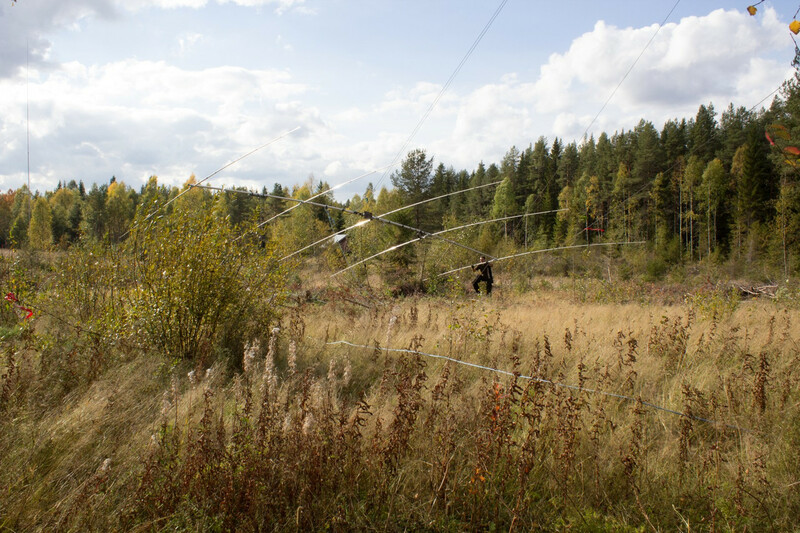 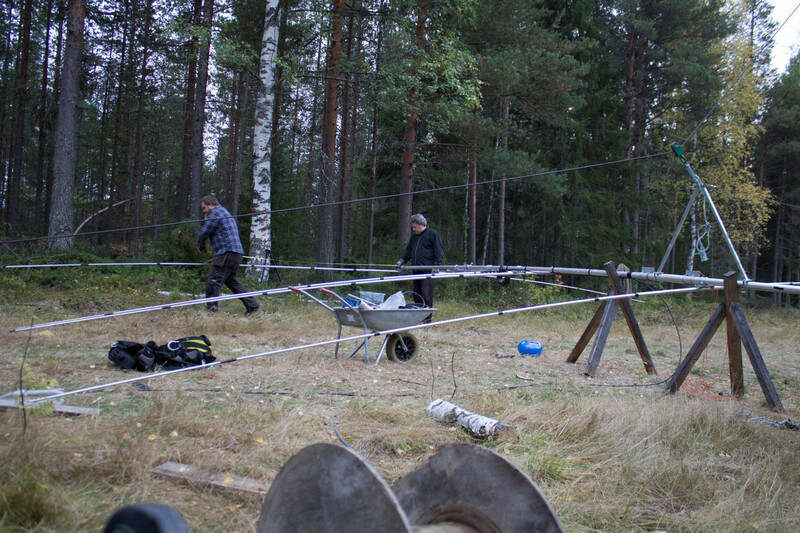 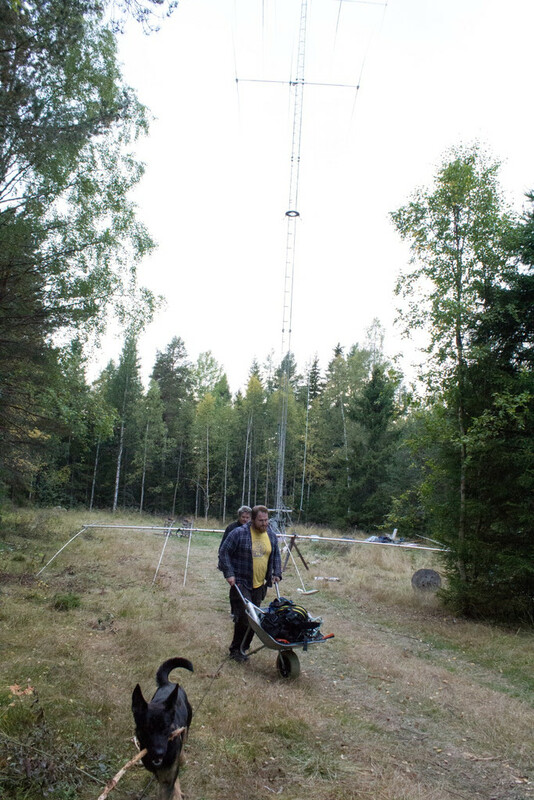 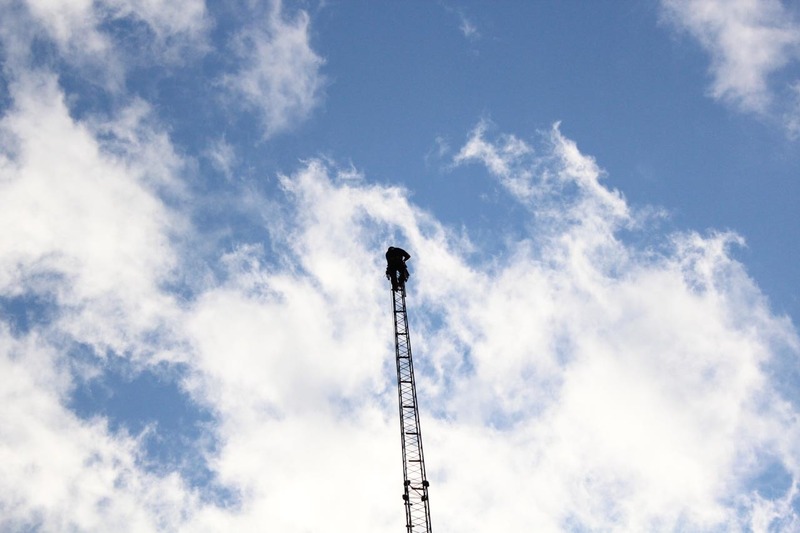 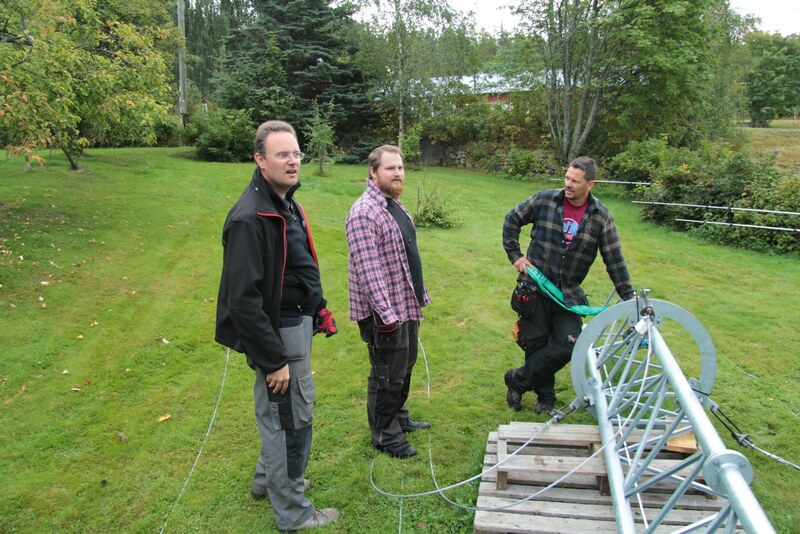 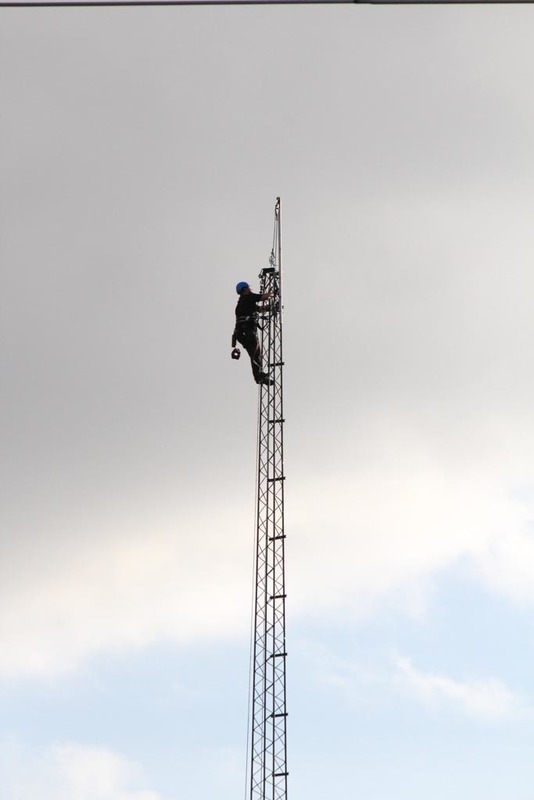 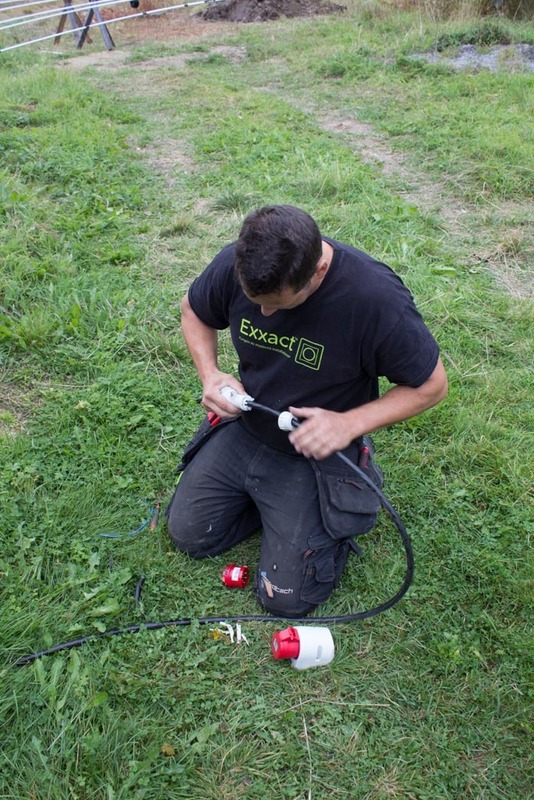 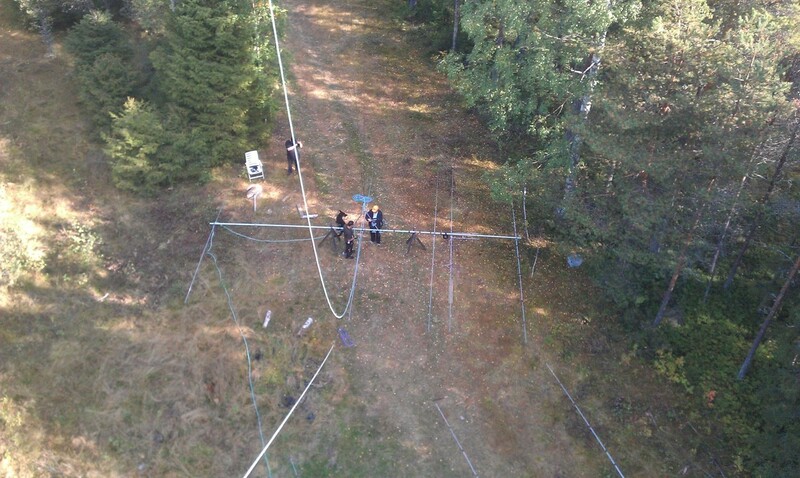 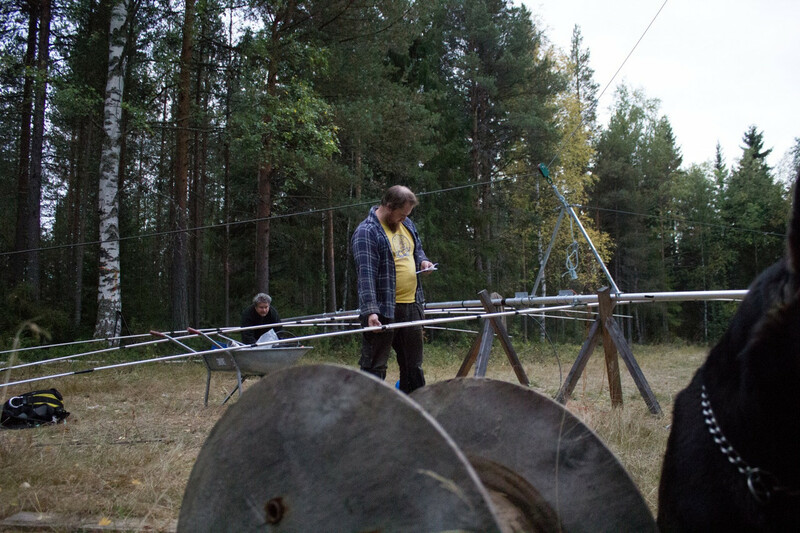 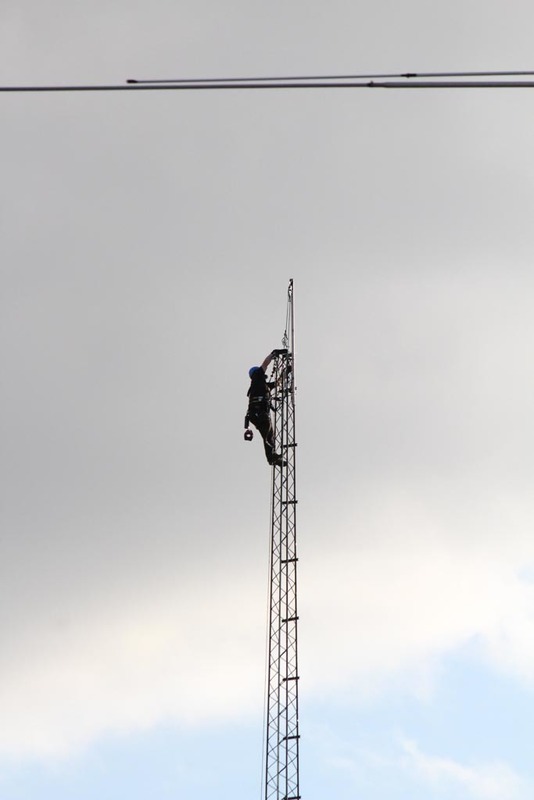 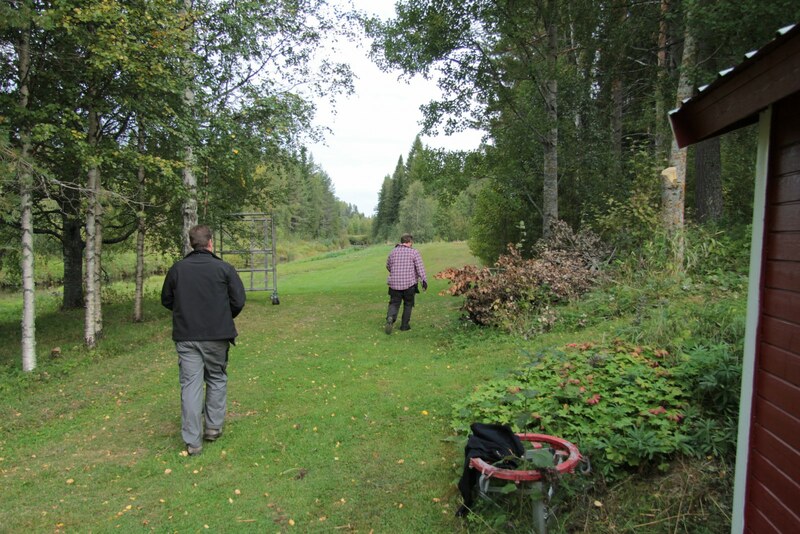 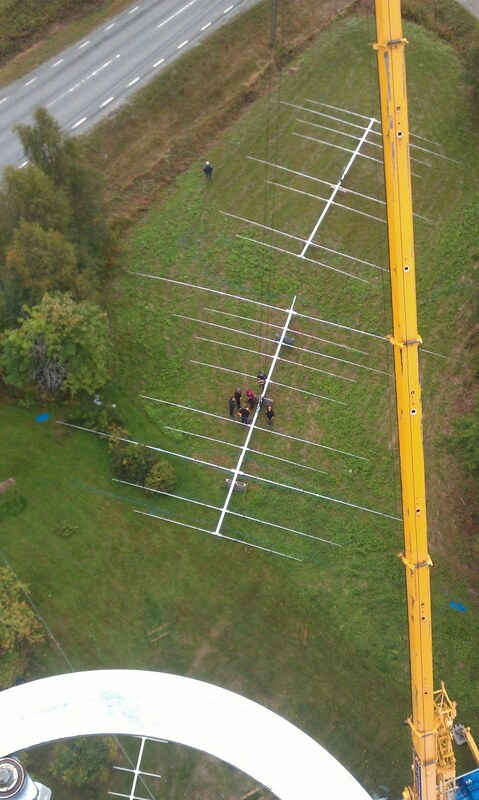 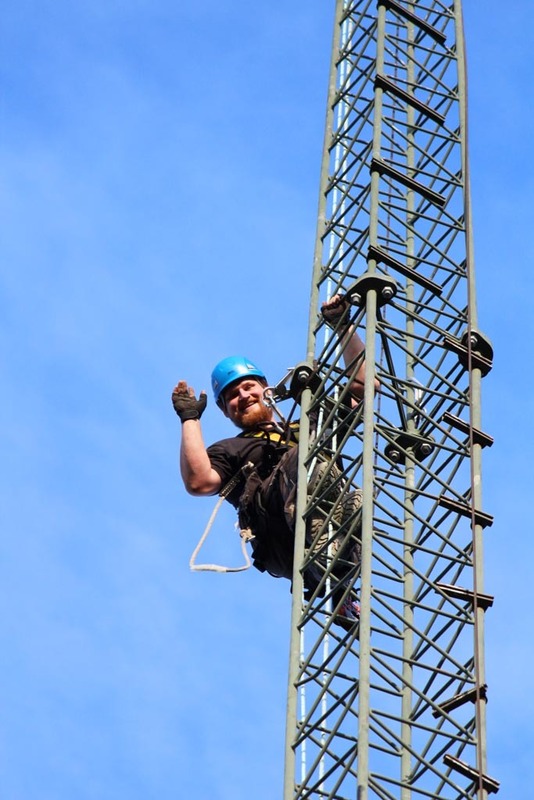 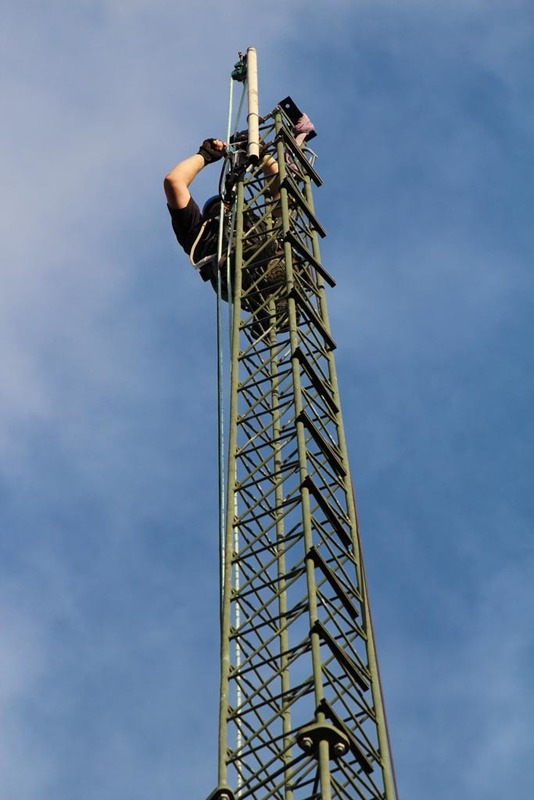 This weekend we were a bunch of people helping to get some antennas up. 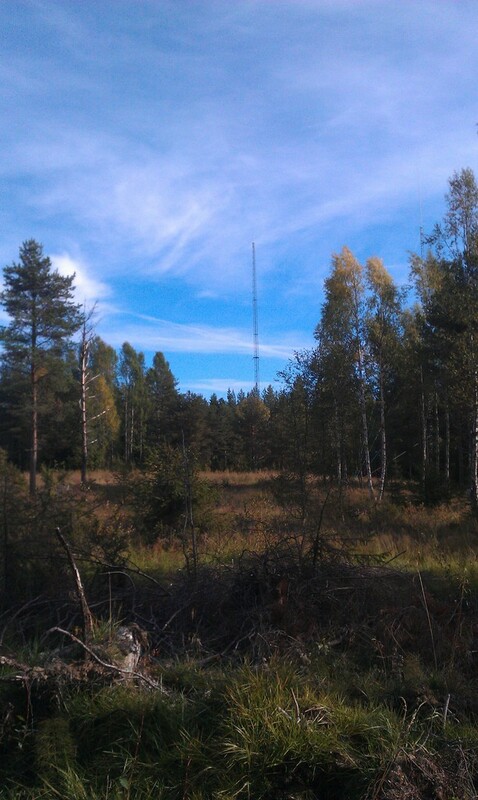 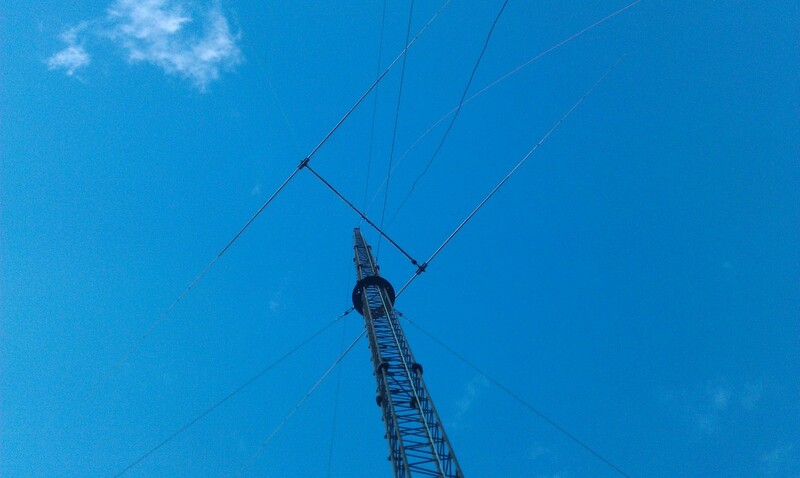 We managed to get the Top 2el on 40m up, the 5/5el stack for 20 and the 3el for 30m up. 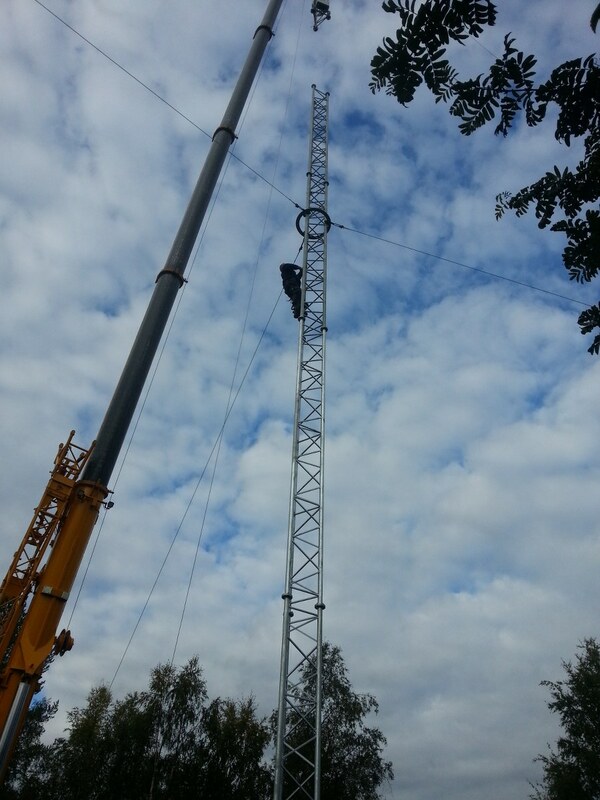 The top 2el for 40 will be moved up 1.5-2m when the tram wire has been removed, because currently it is in the way. 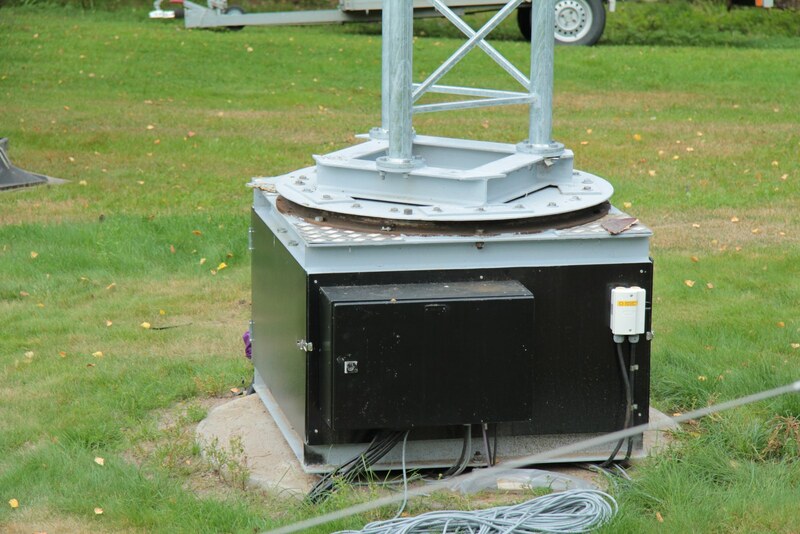 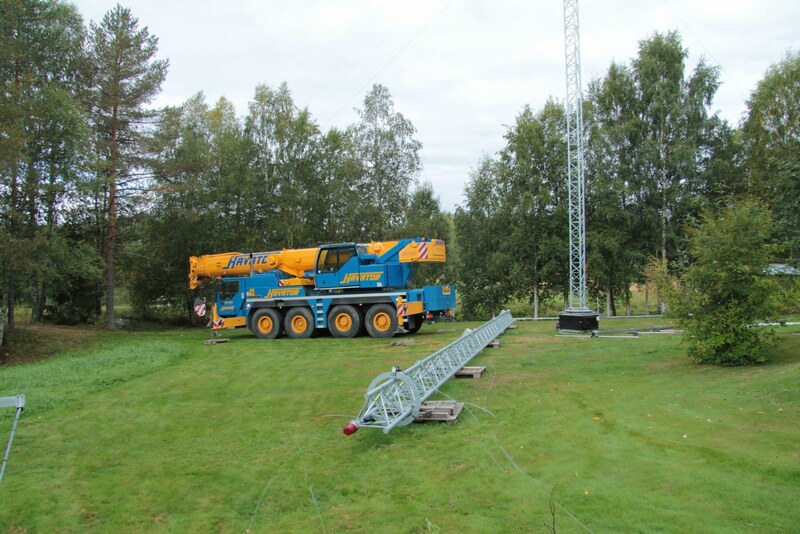 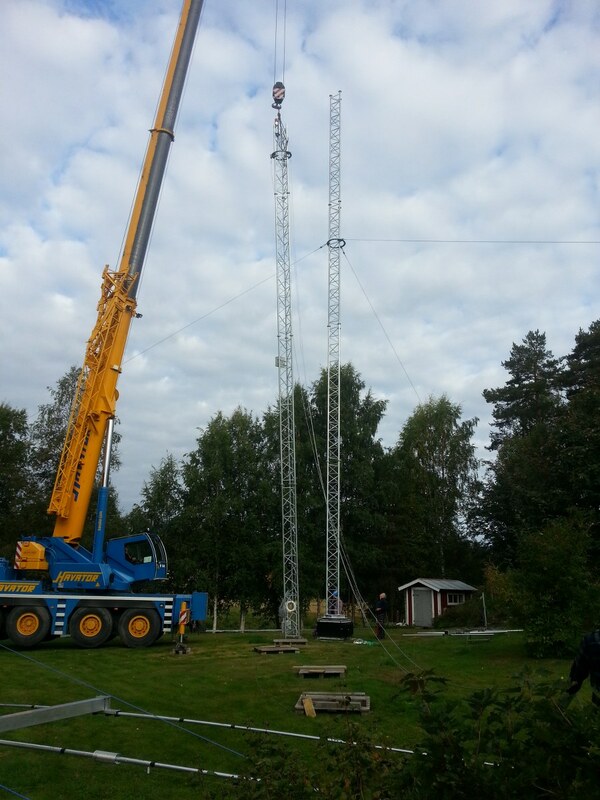 The low 2el for 40m is what is left to put up in the tower and some cables need to be pulled up together with the cabinet which contains a couple of L-matches for the 20 and 40 stack. 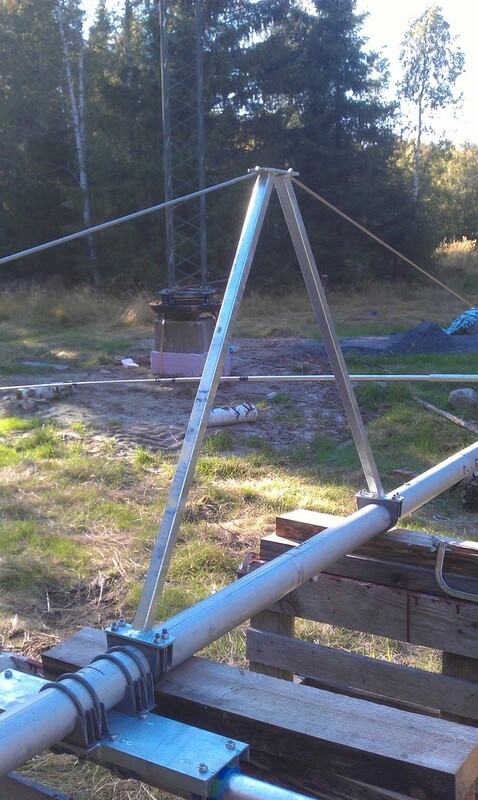 We had some issues from a mistake I had made, making the elements all too short since the center segment on the beam was not as wide as intended. 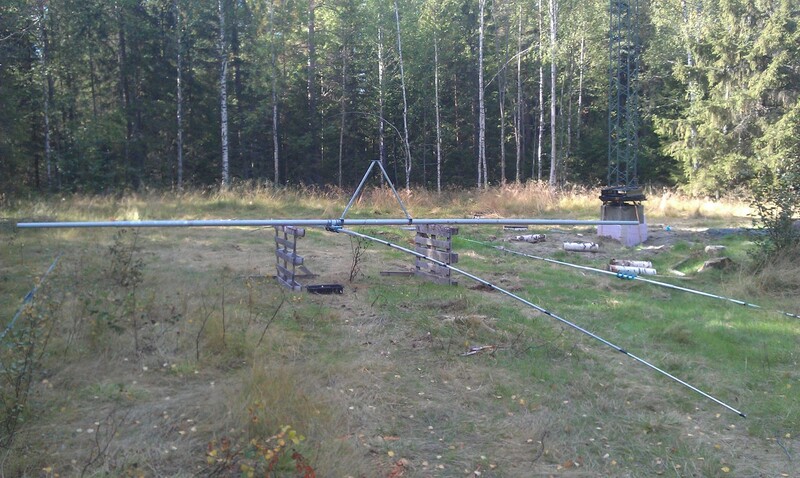 It delayed us a 2-3 hours but we managed to get the planned antennas up anyway, even though it was pitch black when the 30m yagi had been mounted and I was climbing down the tower. 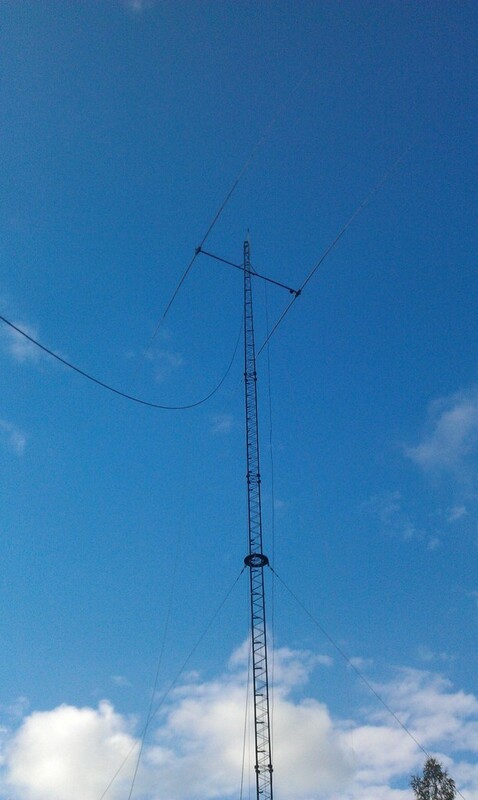 We also took down the 5el for 20 that was temporarily sitting in the WARC tower. 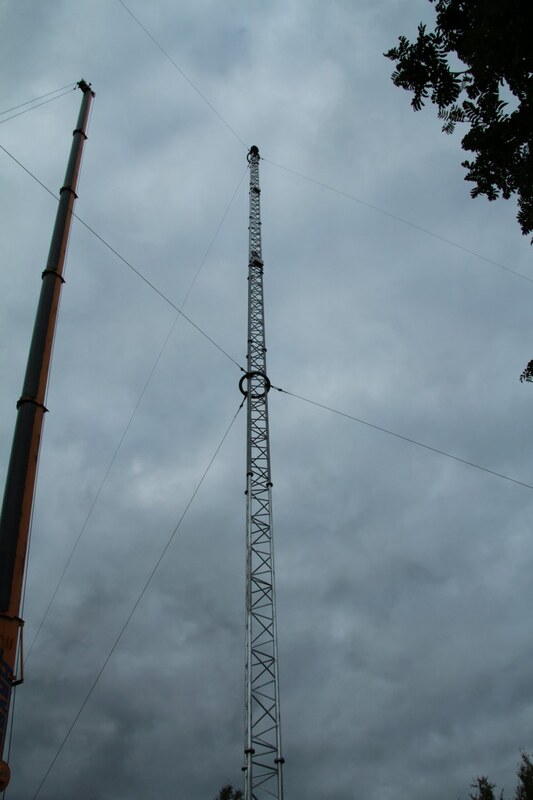 It was quite windy, I suspect winds of up to 15 m/s in the gusts so it was a bit scary since it’s a pretty weak tower (not that there was any risk of it breaking) so it moves around a lot. 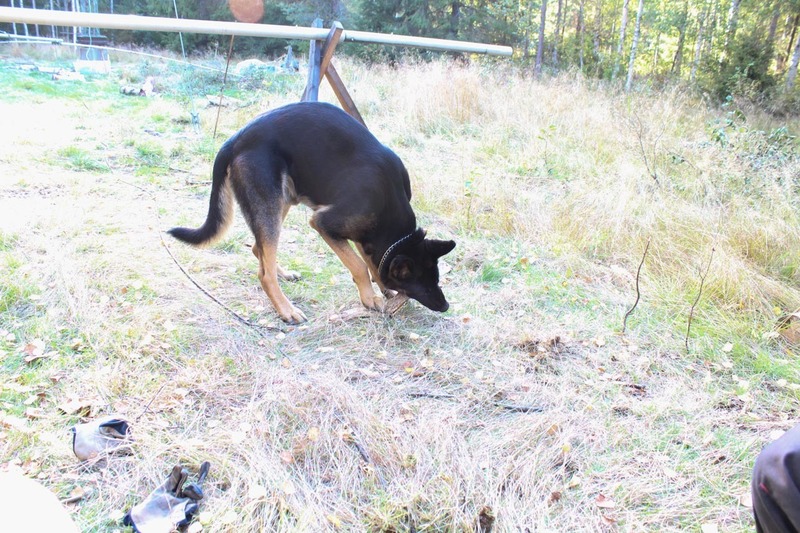 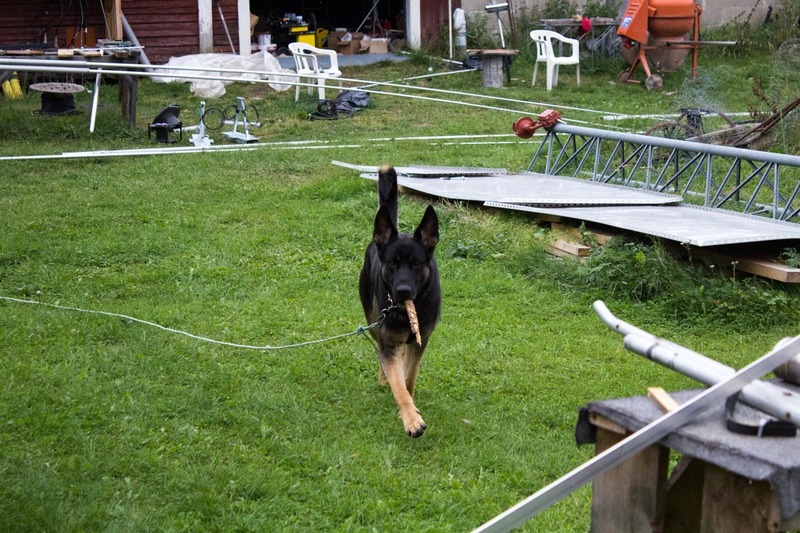 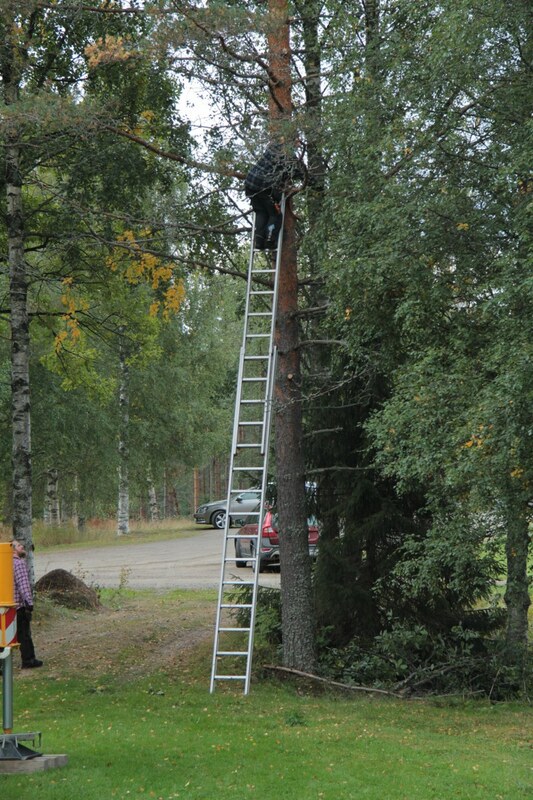 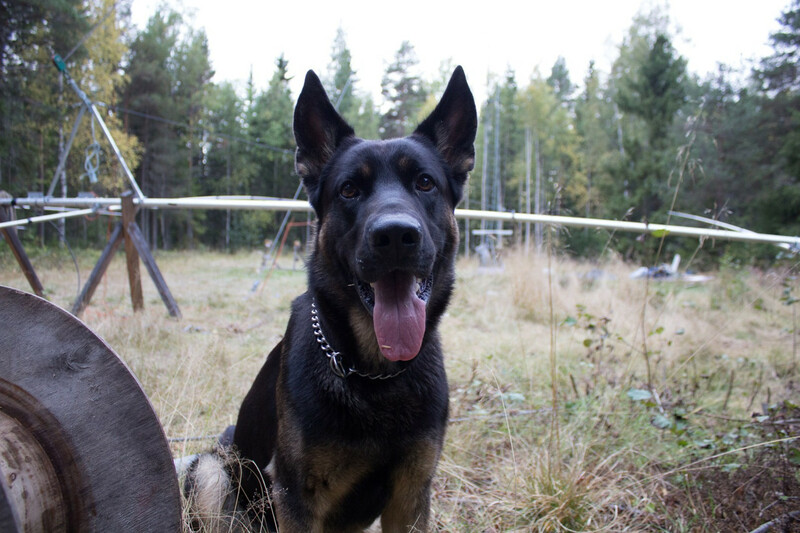 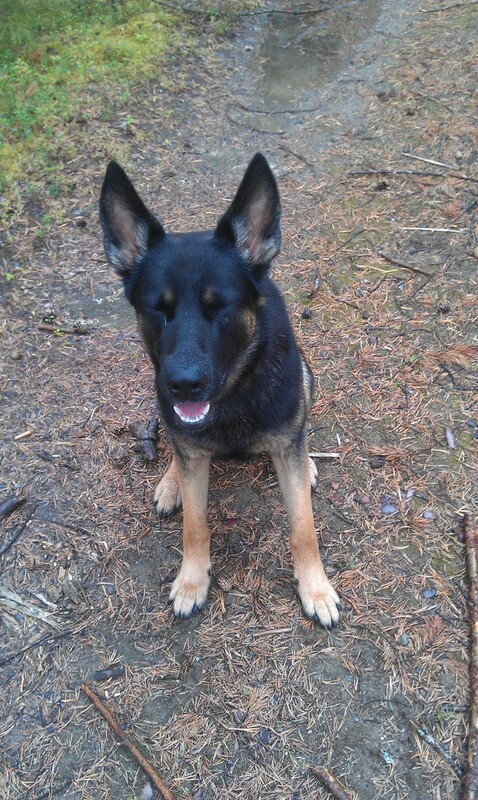 When the dog rammed the guy wires running for a stick didn’t make the experience less scary. 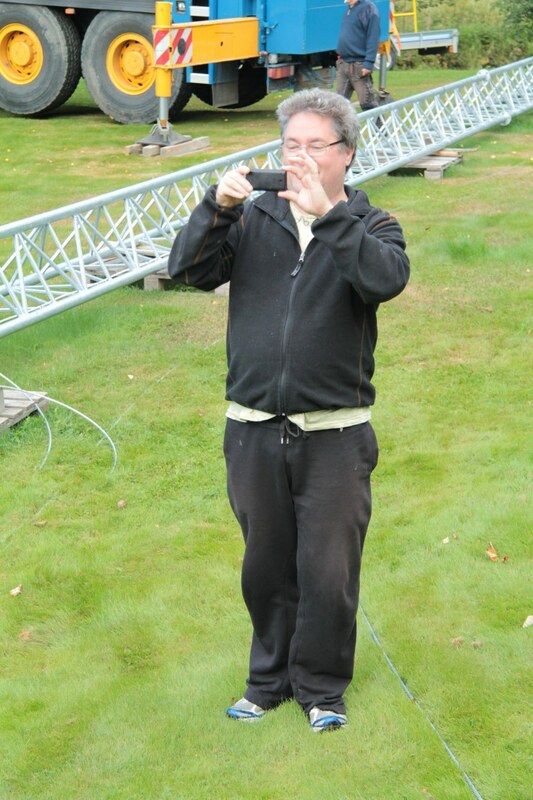 However it all went according to plan even though the rigging took some time. 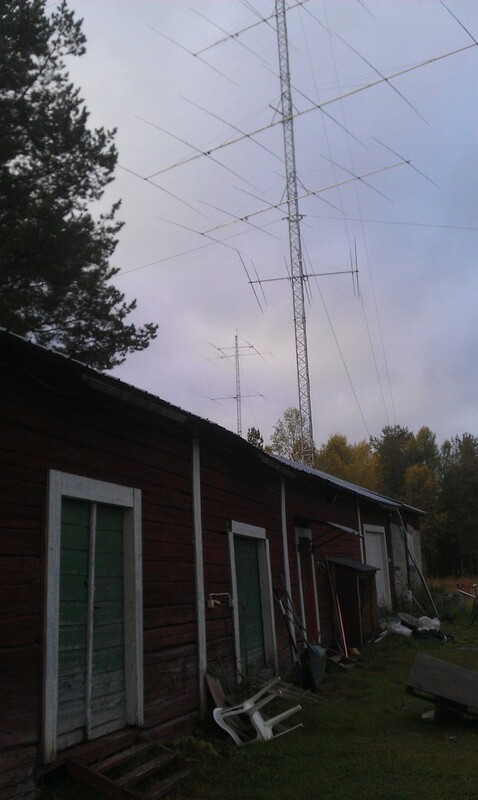 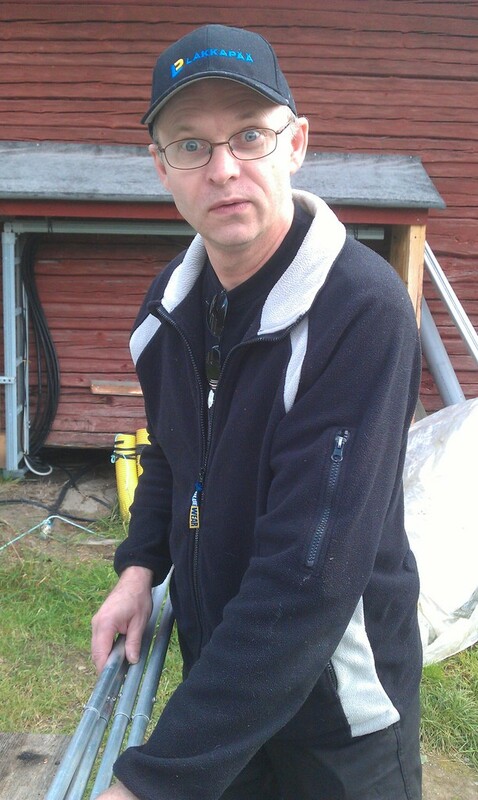 Guys helping out this weekend was SM2UVU, SM2LIY, SM2XLL, SM2XJP and Blixten. 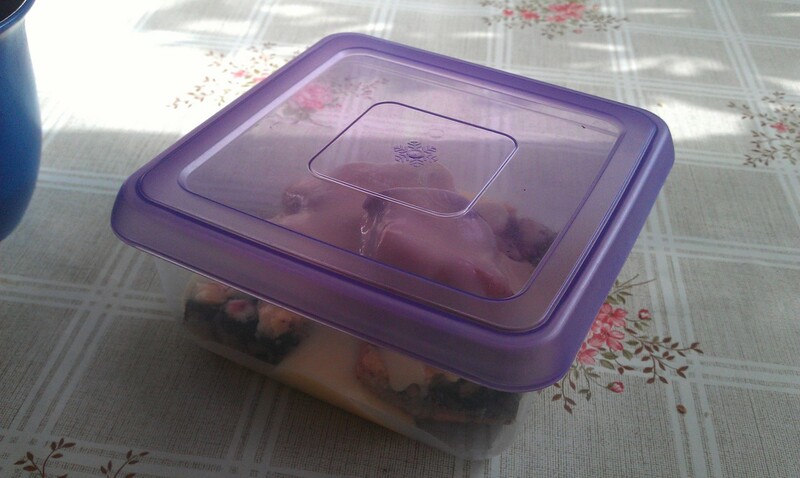 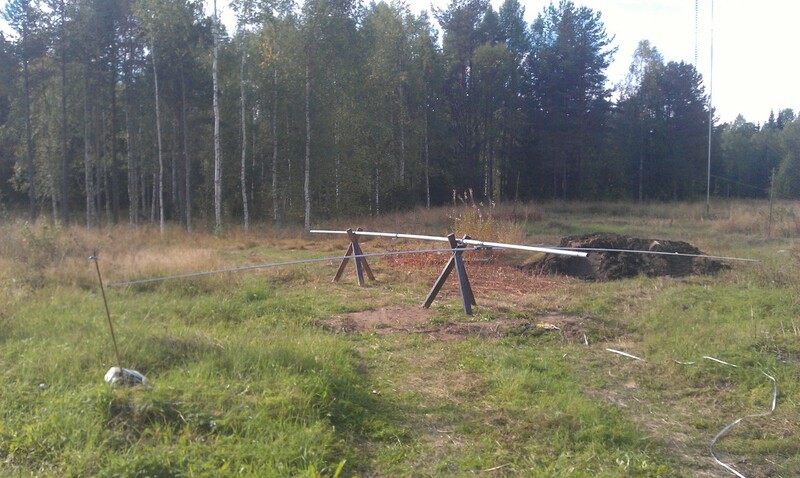 Last week I spent at SJ2W mixing work for myself and work for the actual work which pays. 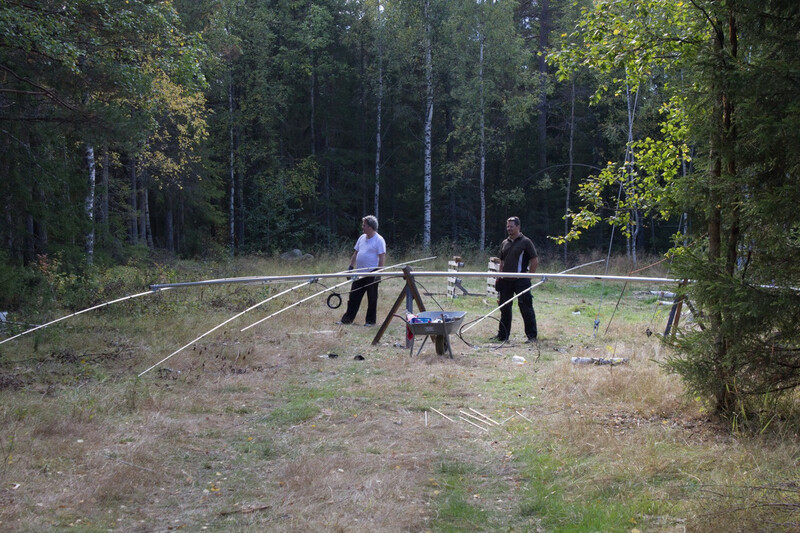 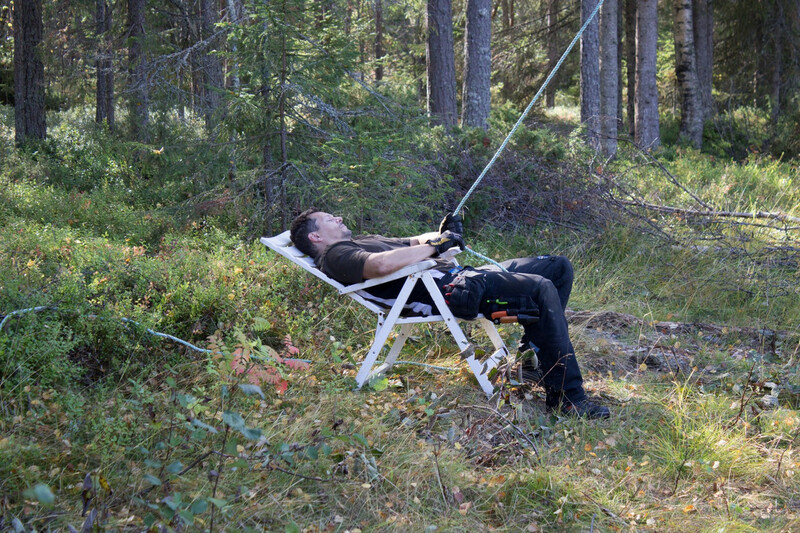 The days were spent making antennas and some of the evenings were spent working. 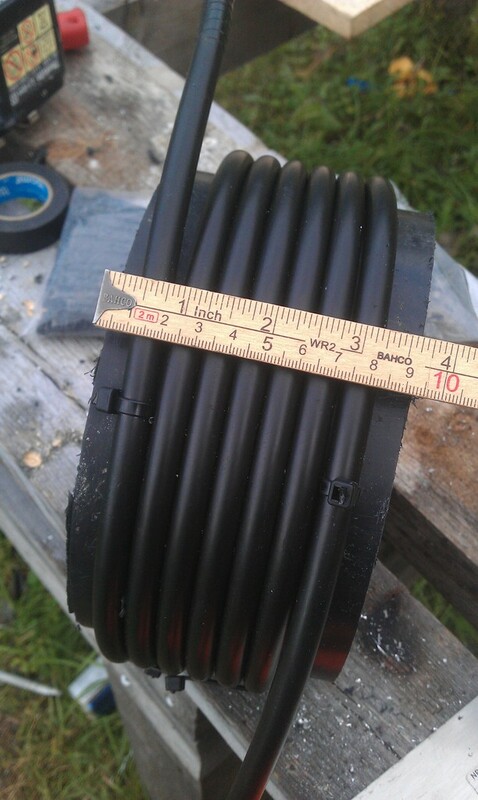 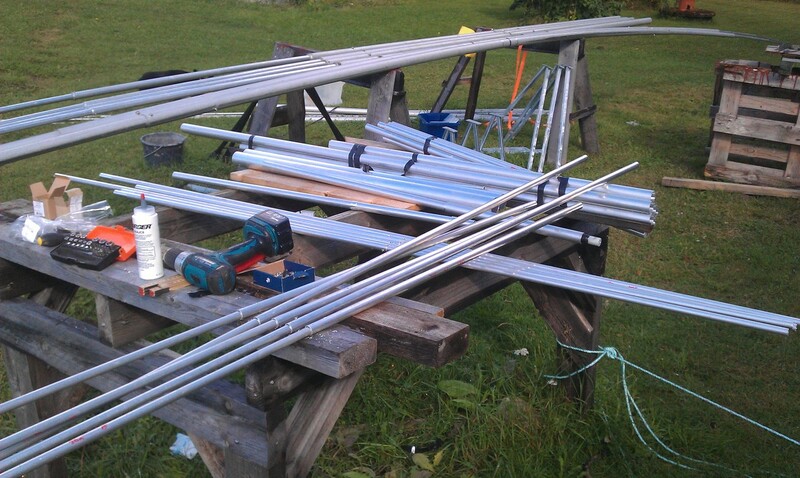 It’s a lot of work to build antennas pretty much from scratch and at the end of the week I was pretty sick of it. 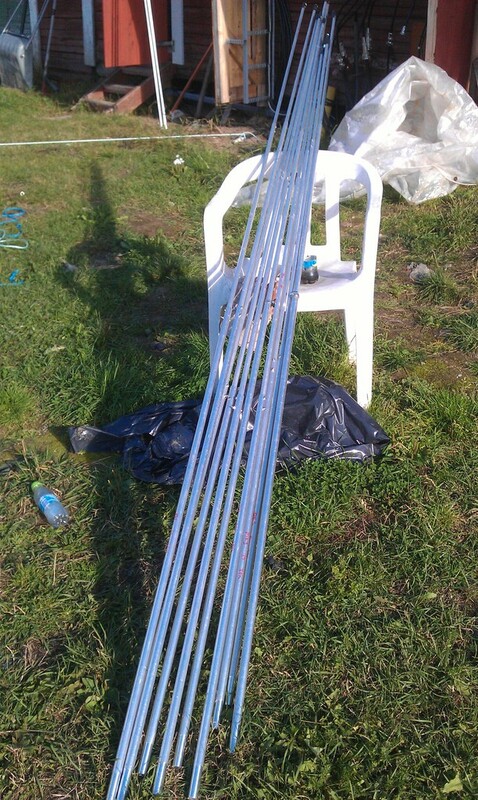 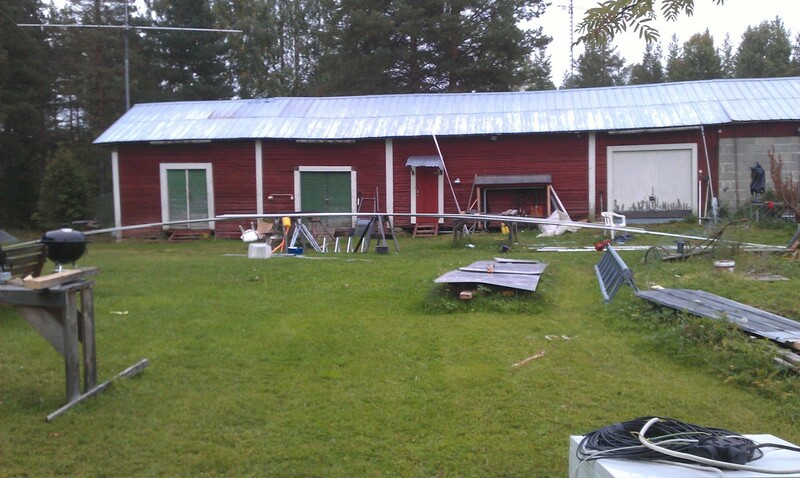 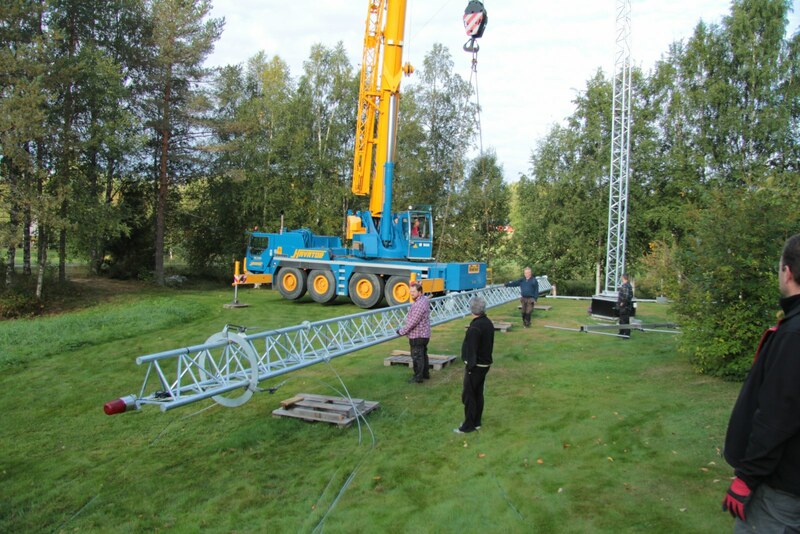 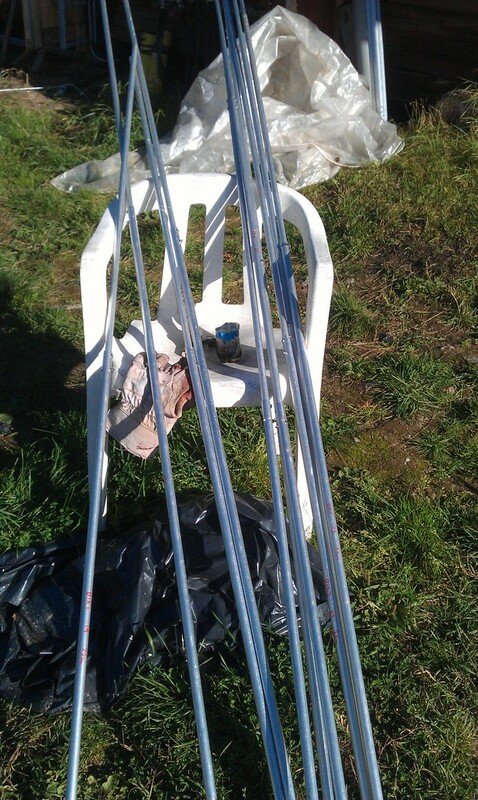 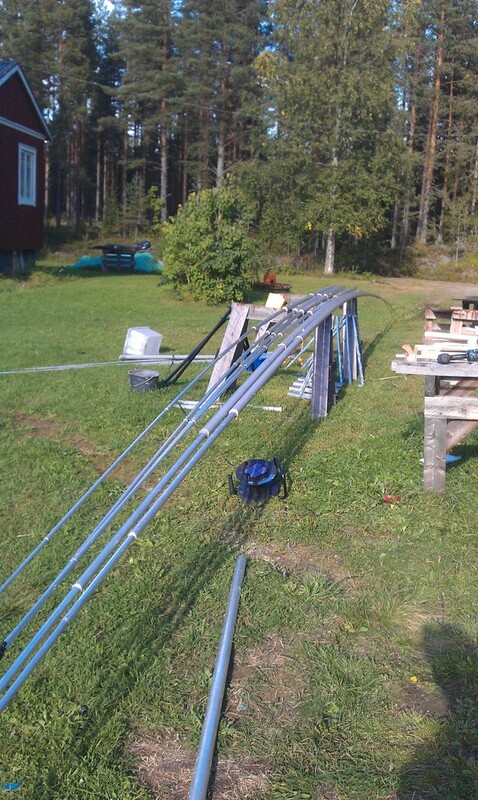 However now three antennas are completely ready to be lifted (20m 5el, 40m 2el and 30m 3el). 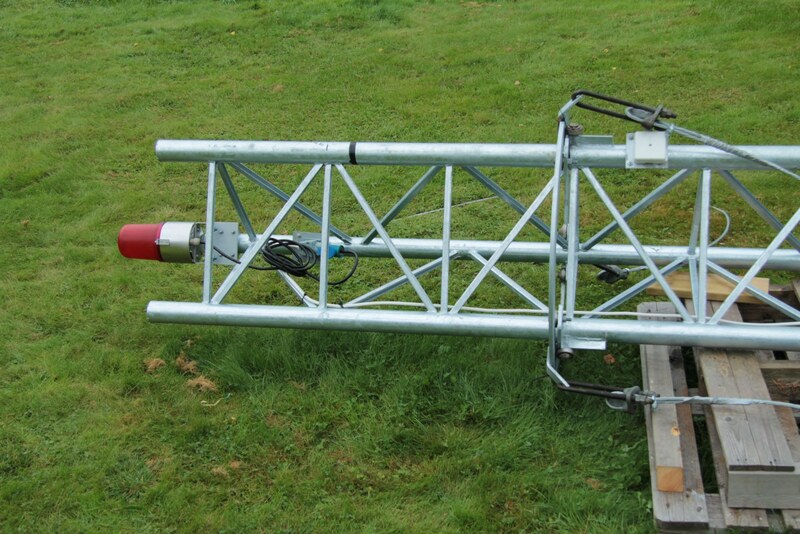 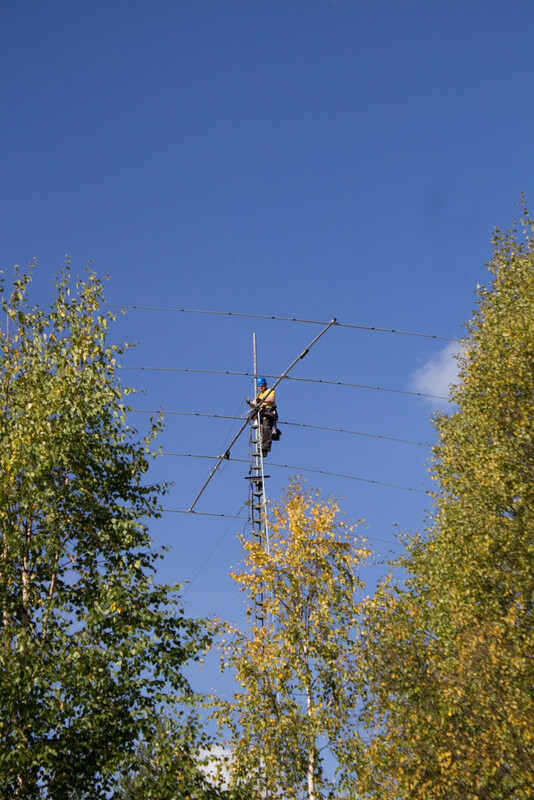 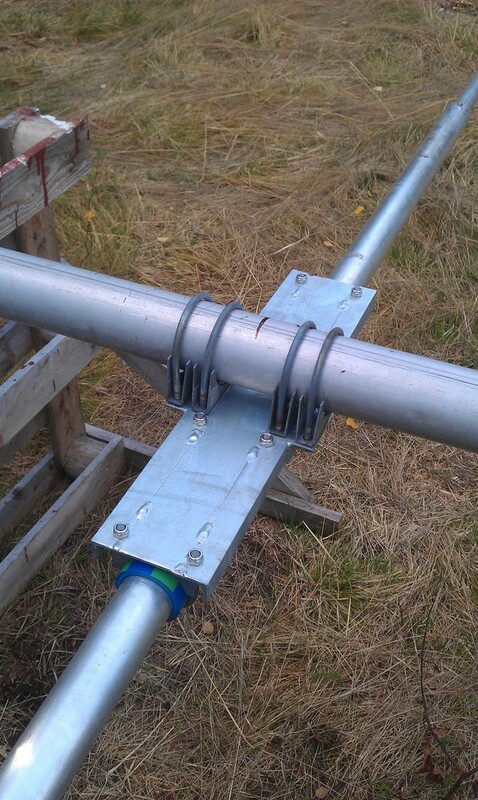 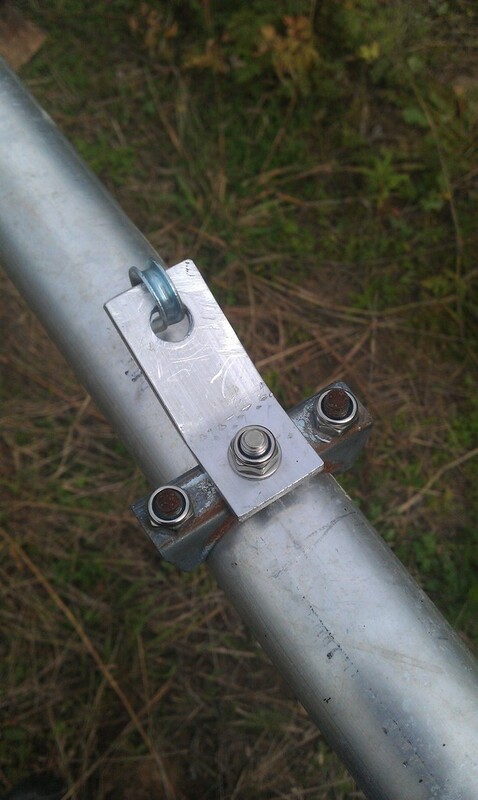 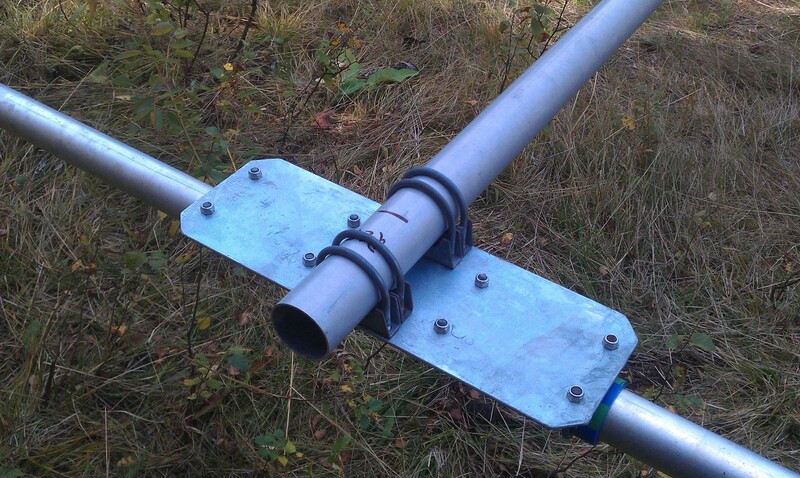 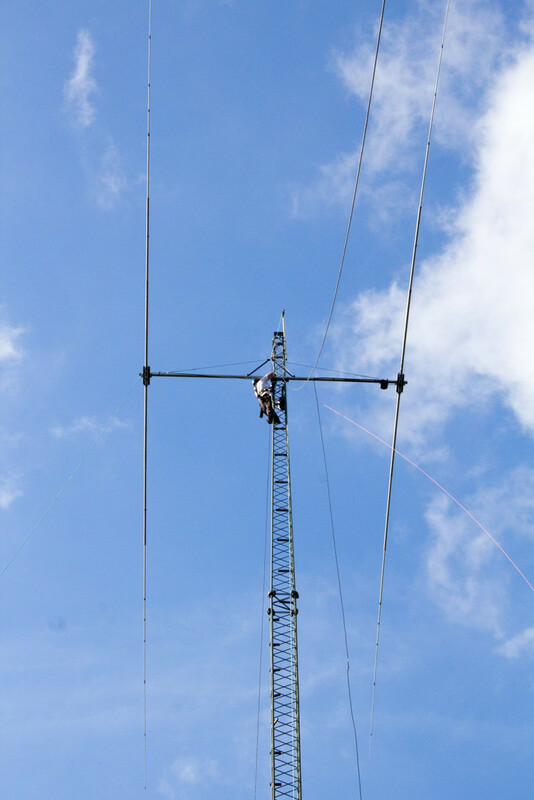 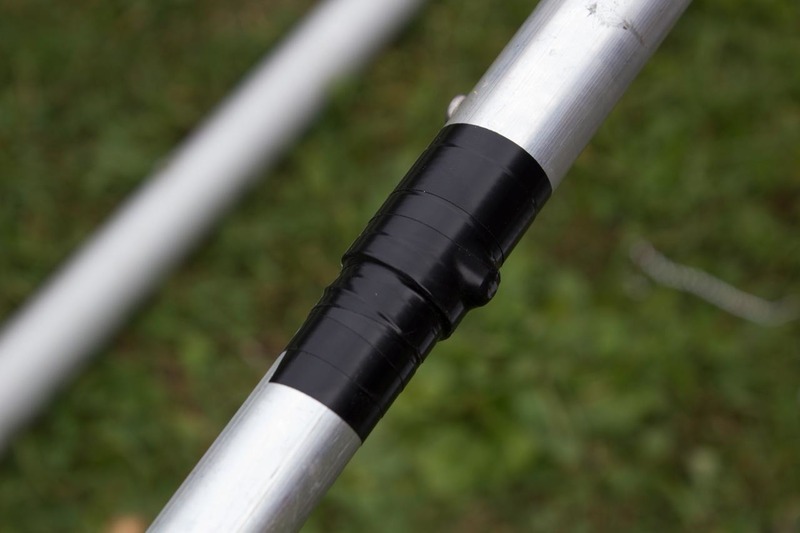 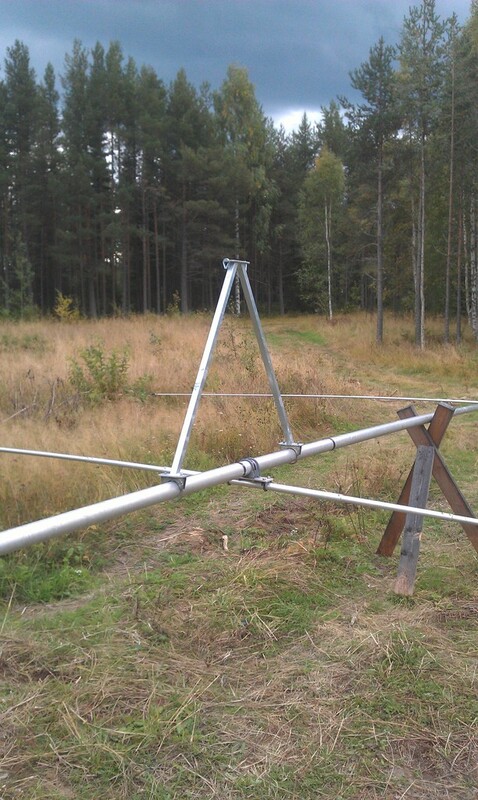 The elements are done for the 2nd 40m yagi as well and we need to take the other 5el for 20m down from the WARC tower and modify the element positions and element length to match the new design. 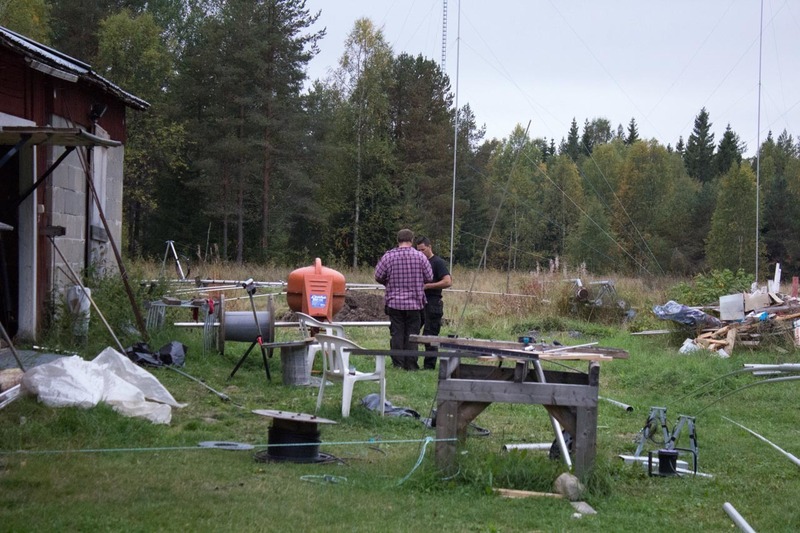 SM2XLL, SM2UVU and SM2XJP were the helpers during the weekend. 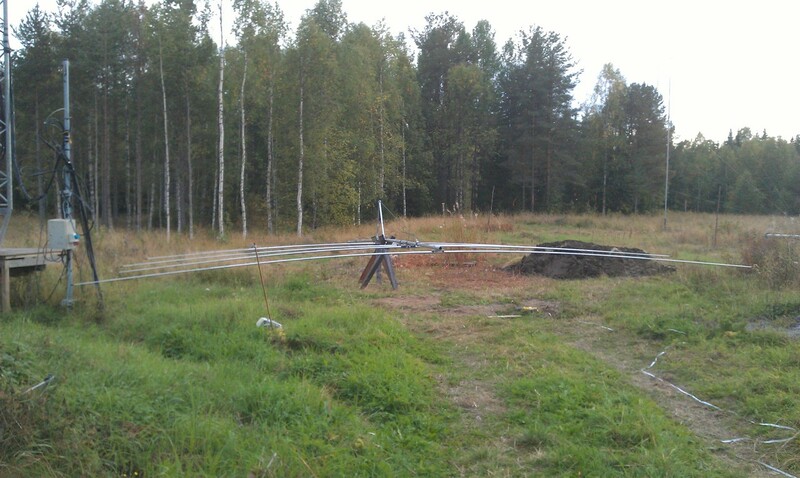 SM2UVU showed up with some cable so we got 3-phase to the military tower position. 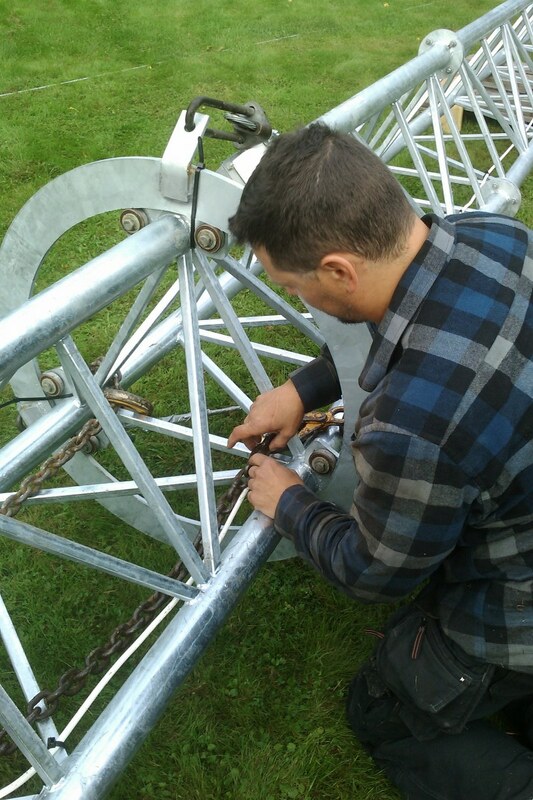 When we were going to start the winch it was totally stuck and after we’d taken it apart and cleaned it, after we noticed some insects had made a nest in it, it worked smoothly again. 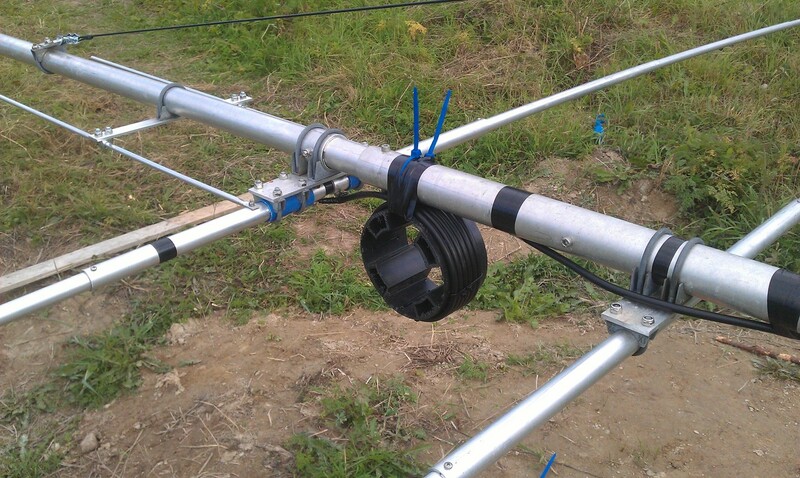 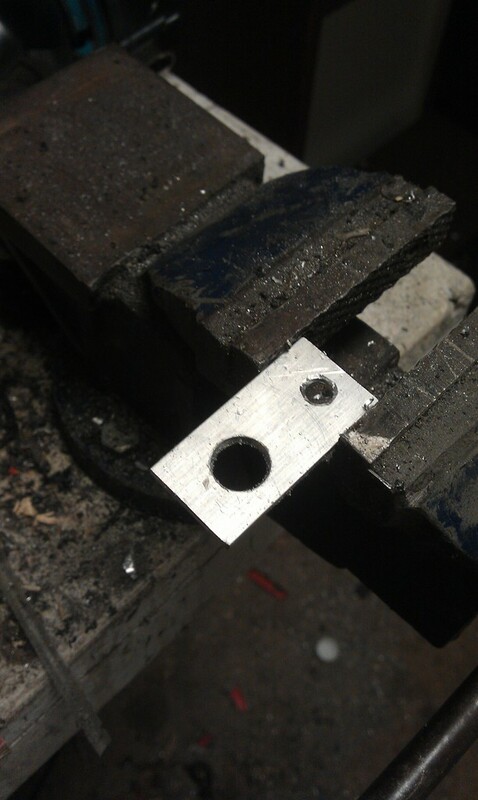 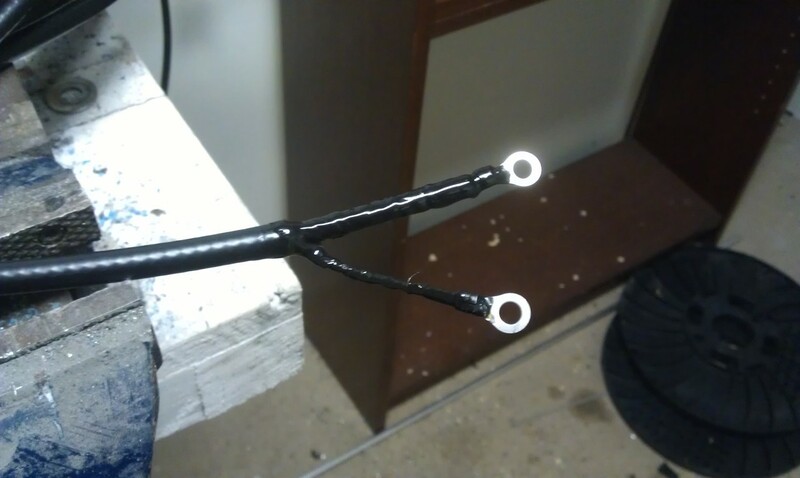 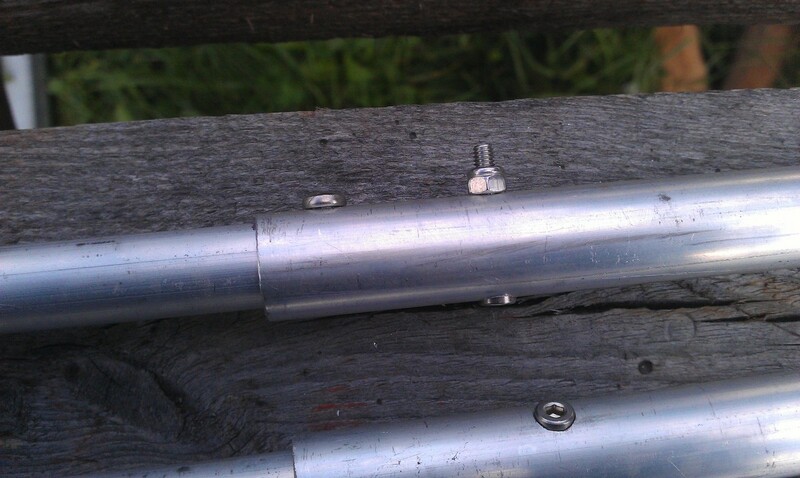 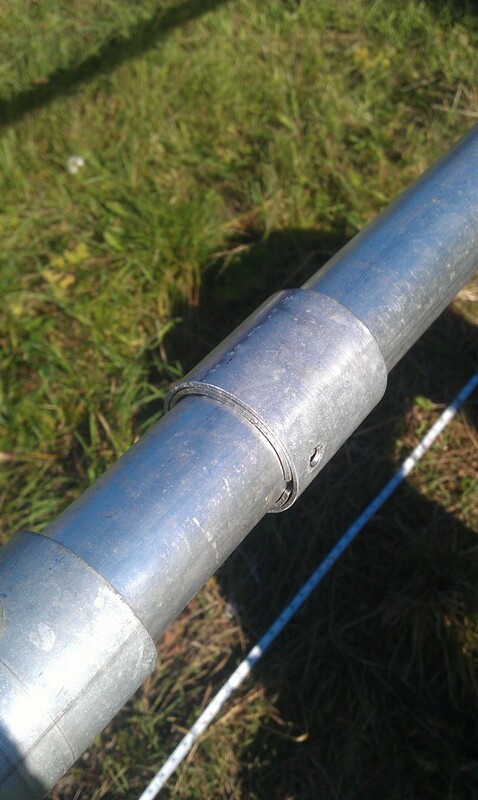 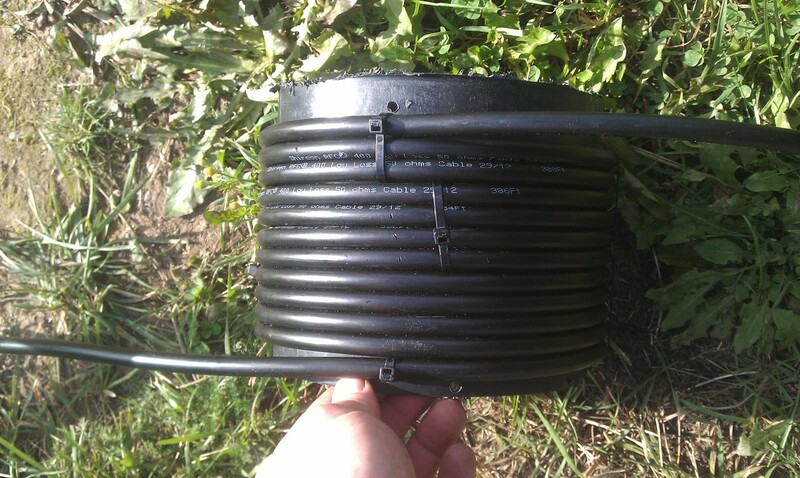 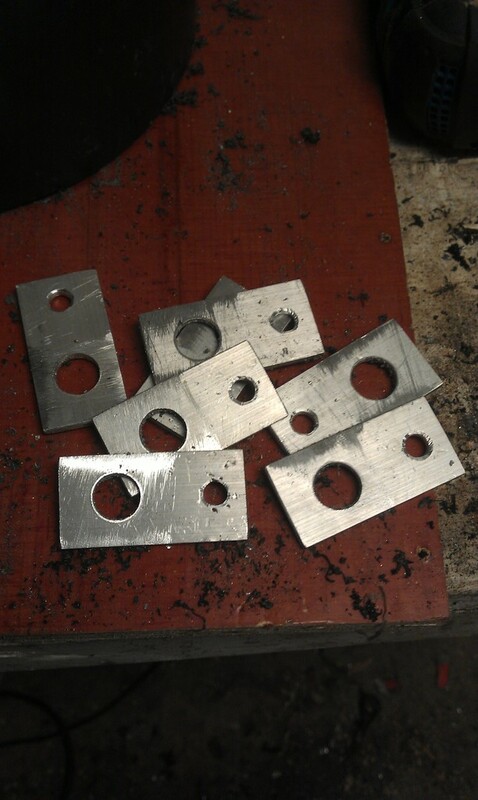 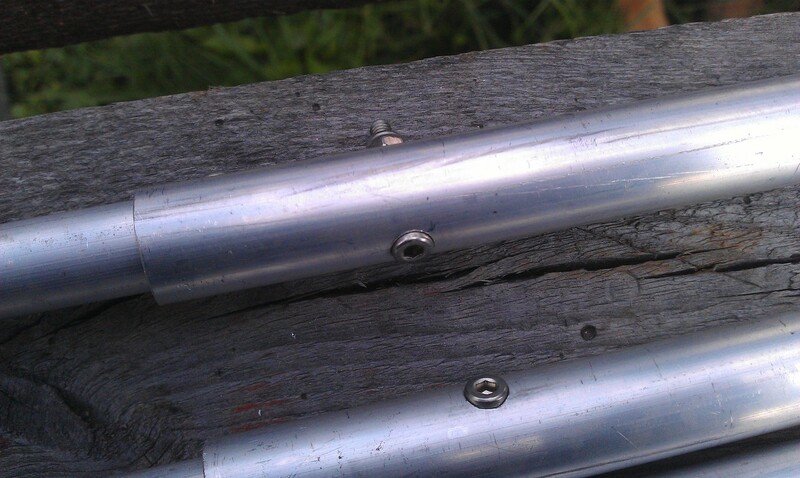 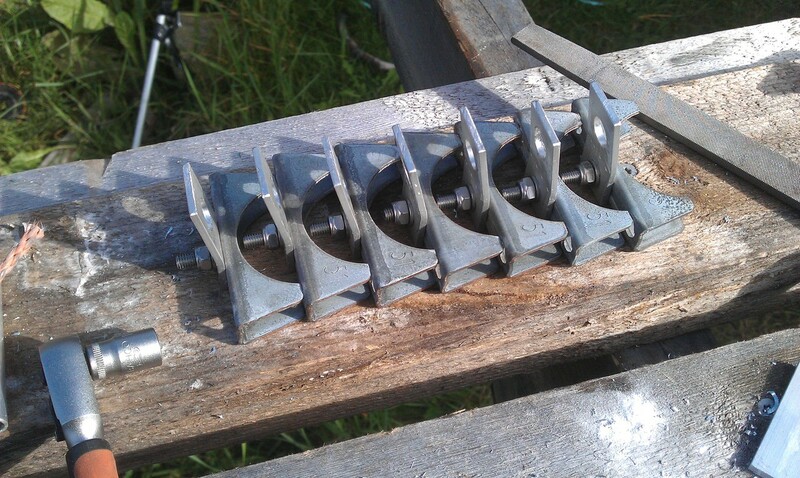 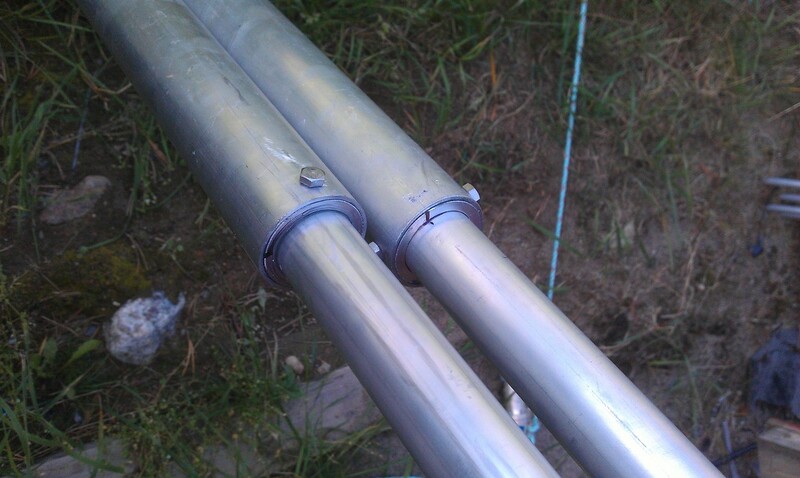 SM2XLL also managed to find some 76mm clamps for us that we were missing sine a delivery had failed from Swedol. 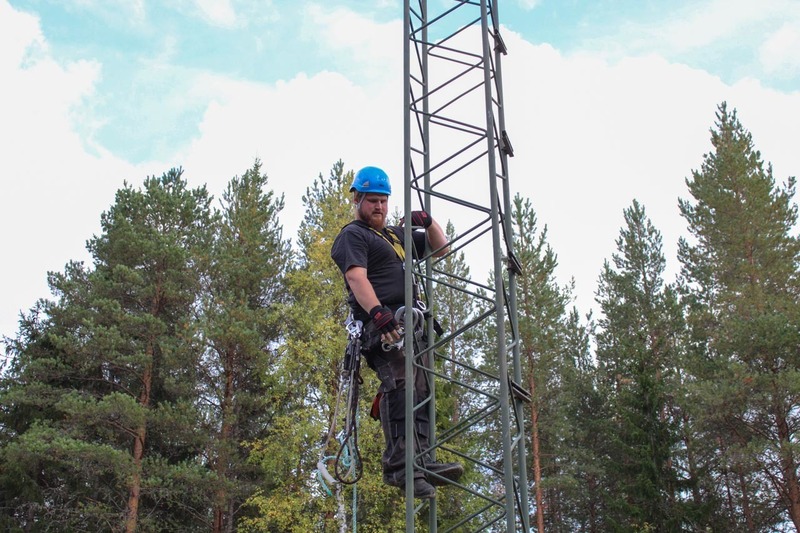 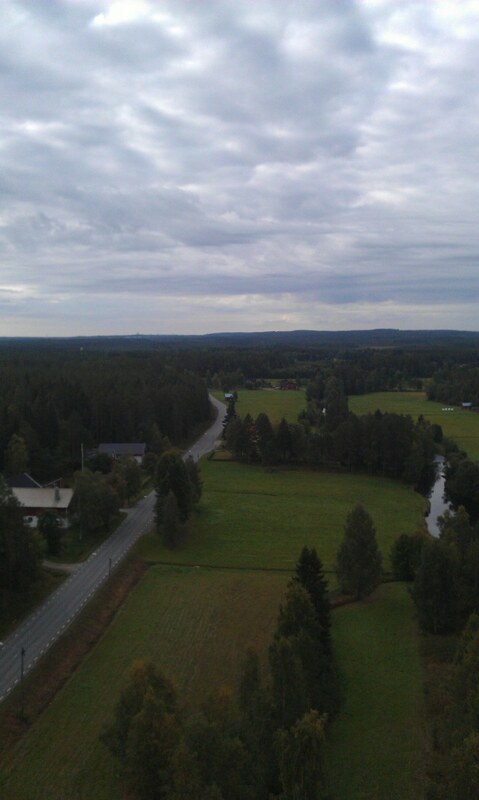 I climbed up with the tram wire and lift rope in the tower and it is a bit scary, the top part of the top section is only 20cm and it moves quite a bit in the top, however after a while I got used to it and it wasn’t so scary anymore. 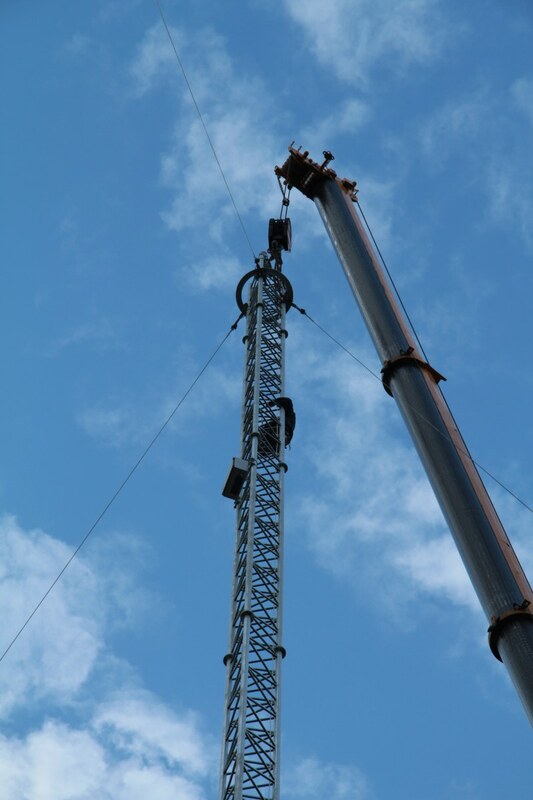 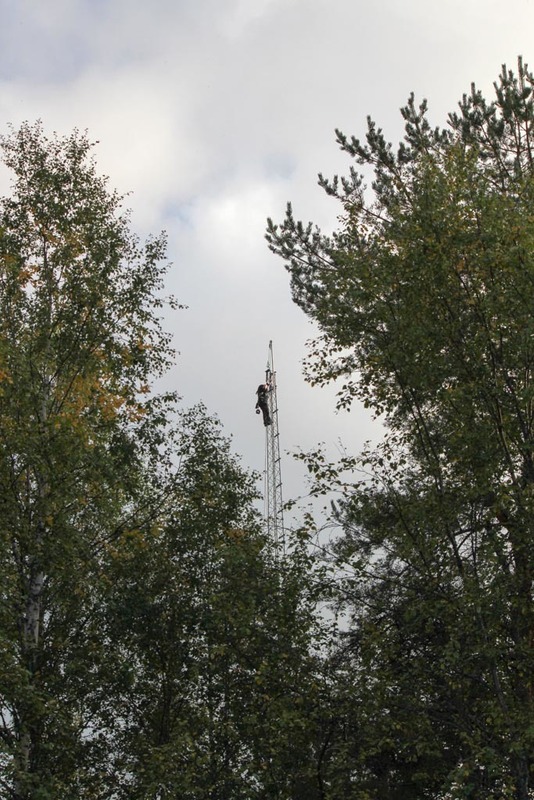 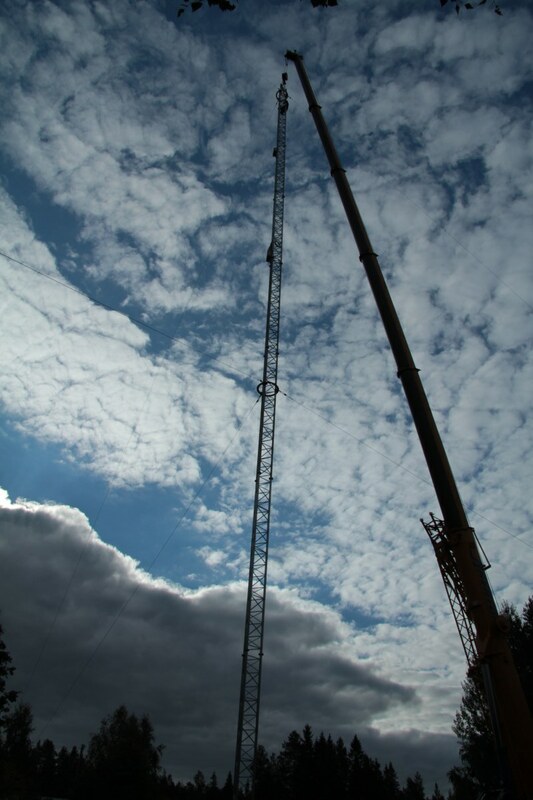 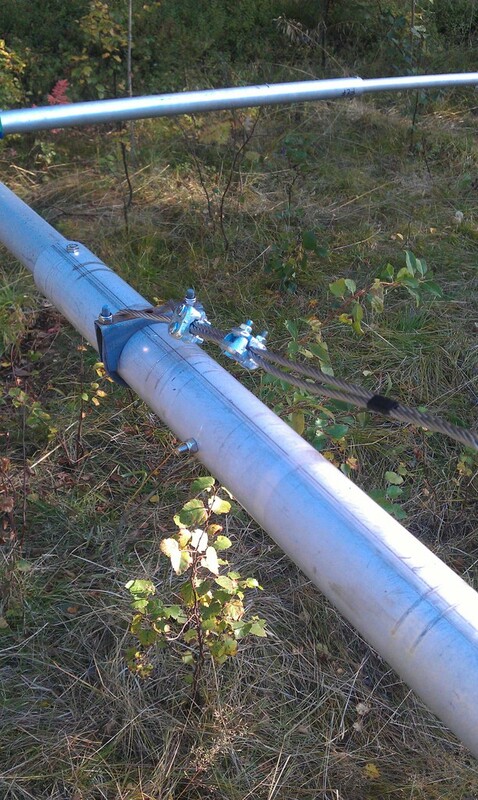 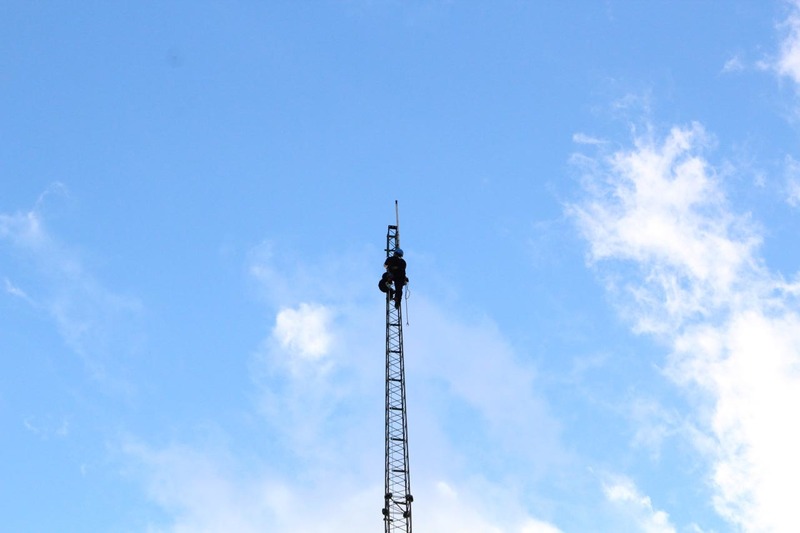 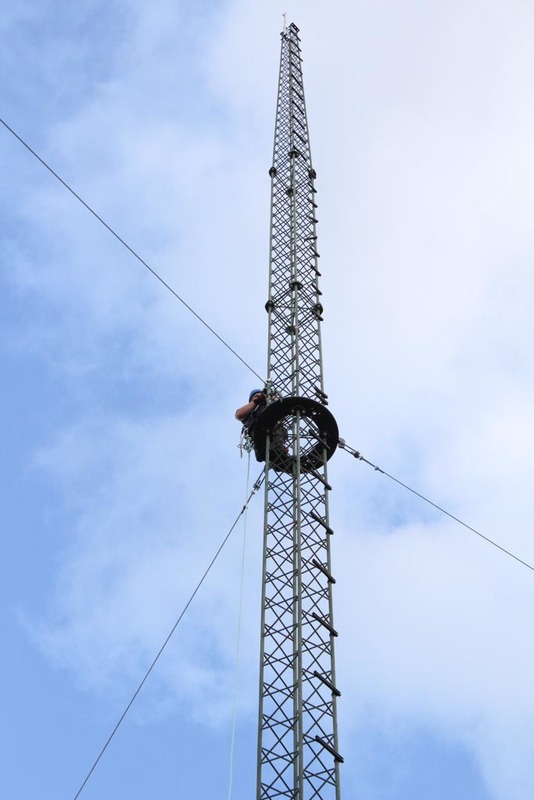 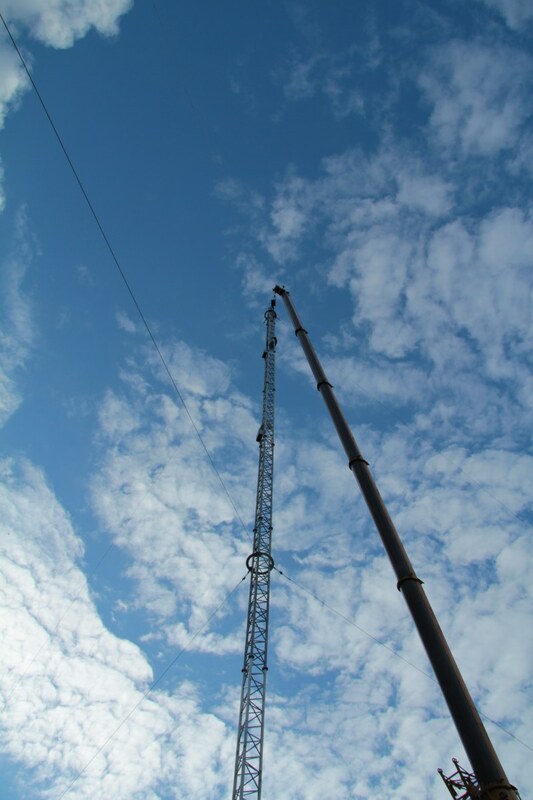 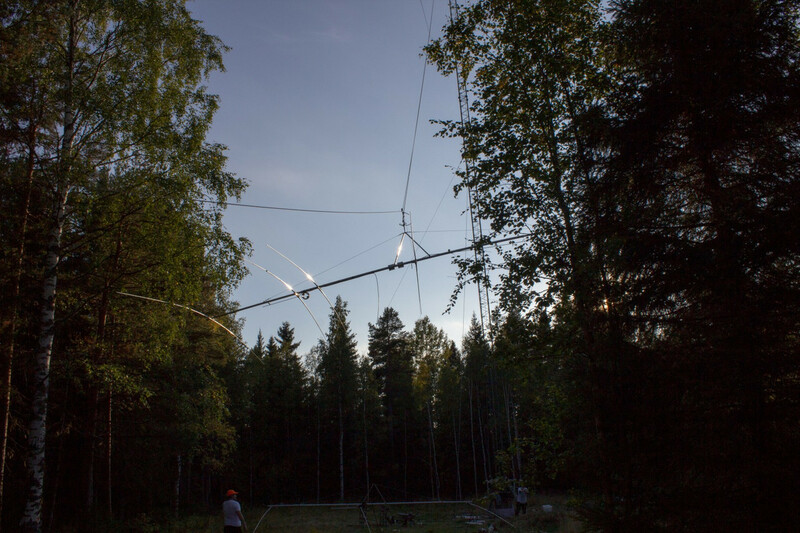 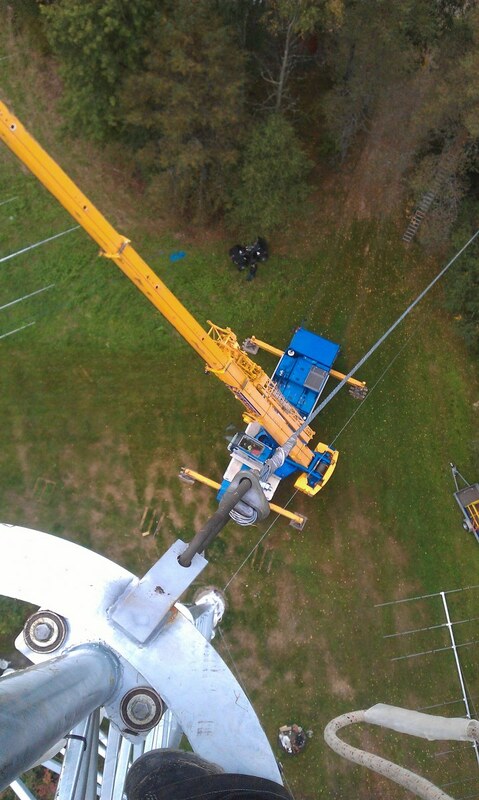 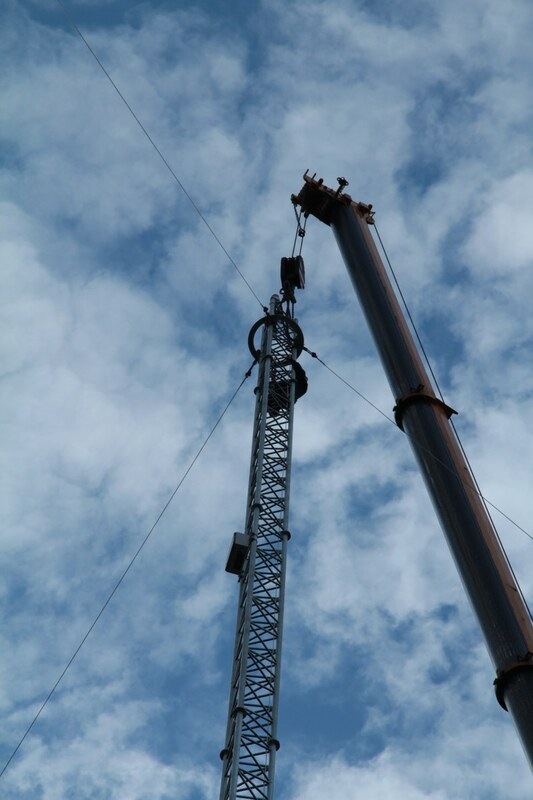 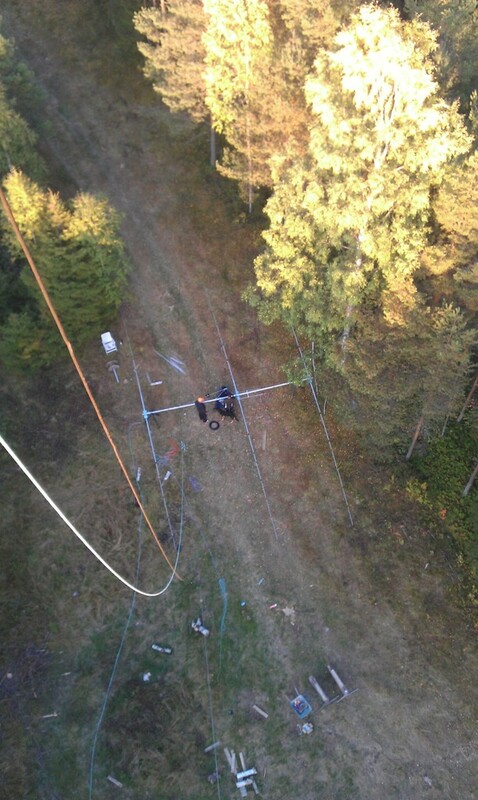 We managed to get one measurement done on the top 40m and it looks promising, but we figured that we will need to hoist it up to the top to actually see how it will look, because now we have too much impact from the tram wire and guy lines plus the ground. 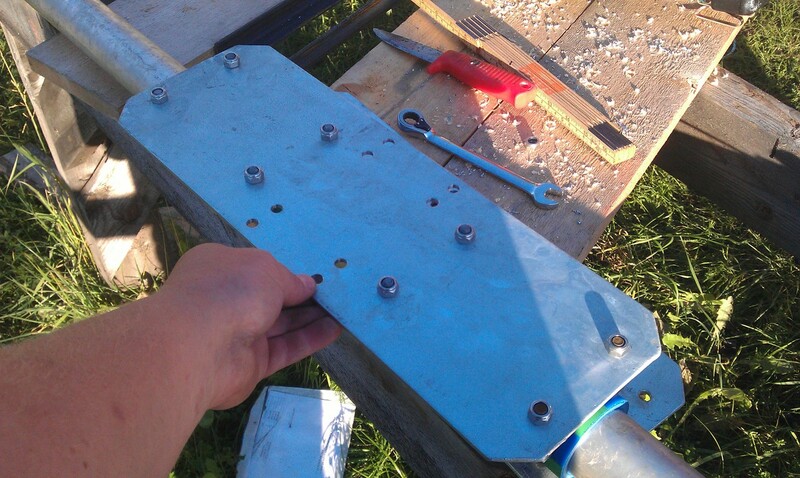 Hopefully we’ll get something up this next weekend. 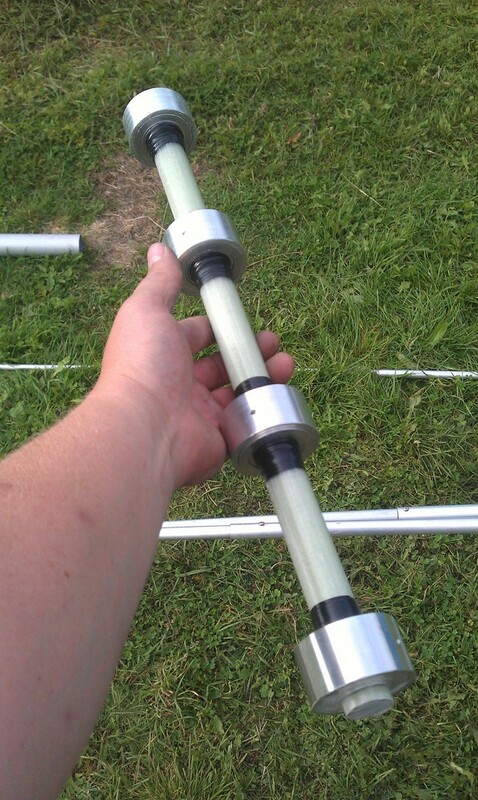 I am spending the week at SJ2W building antennas and also trying to learn the NXP CORTEX M3 platform for work, however it’s been mainly antennas being built. 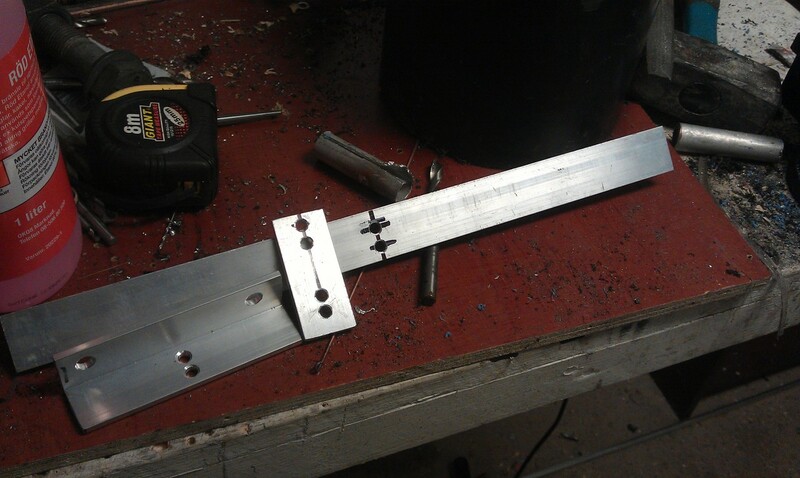 I have made some progress but it takes time. 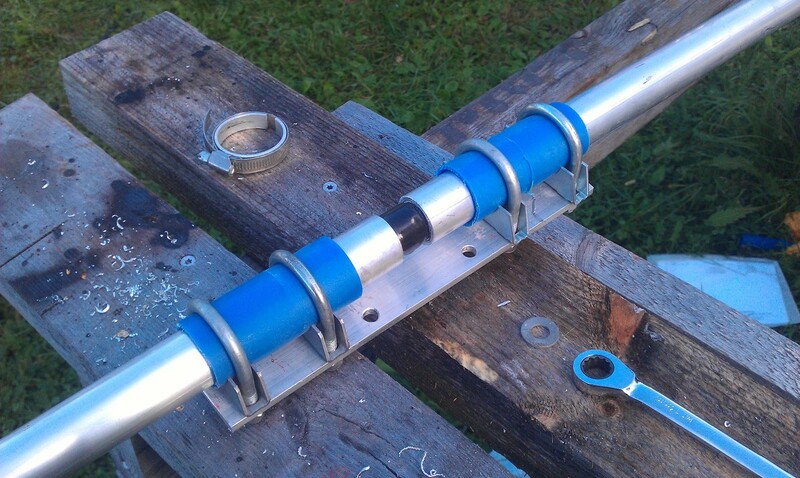 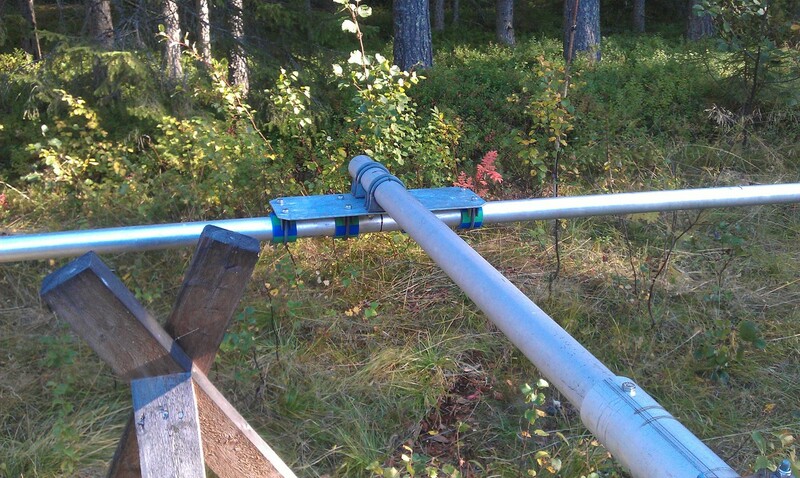 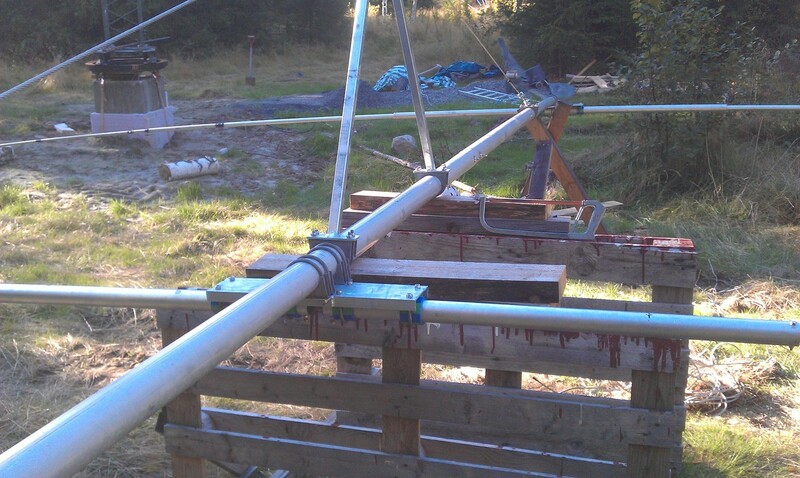 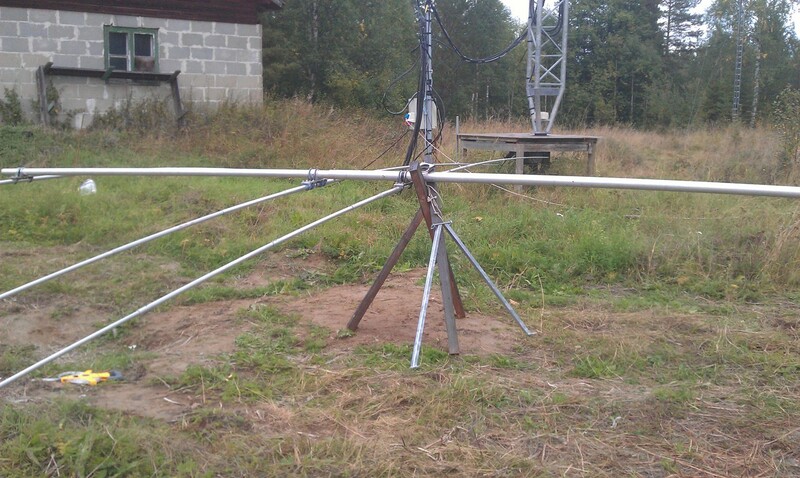 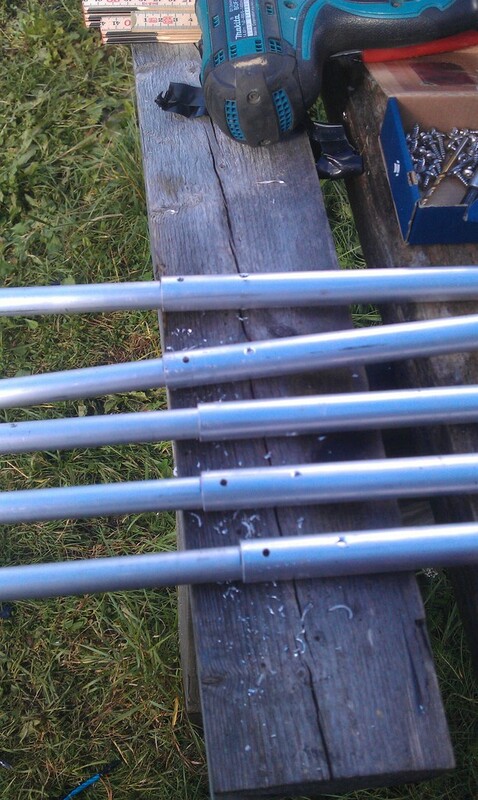 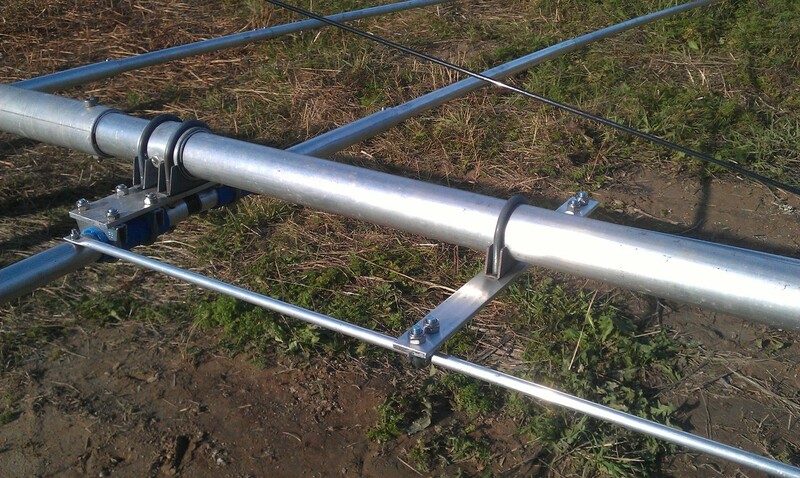 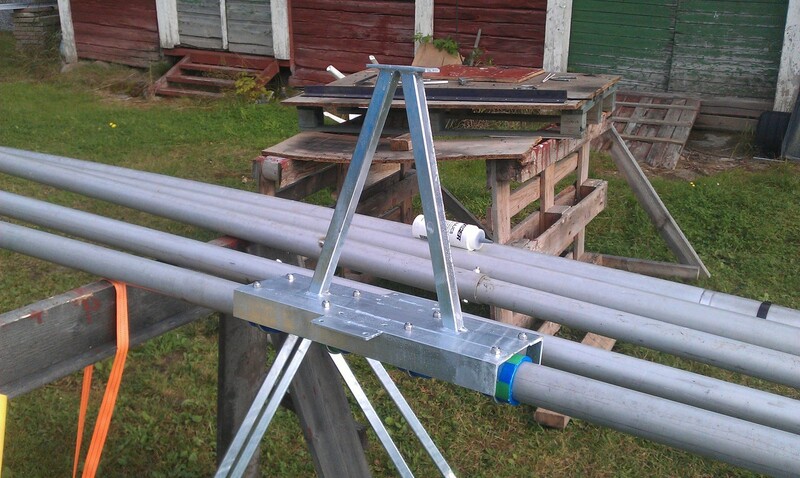 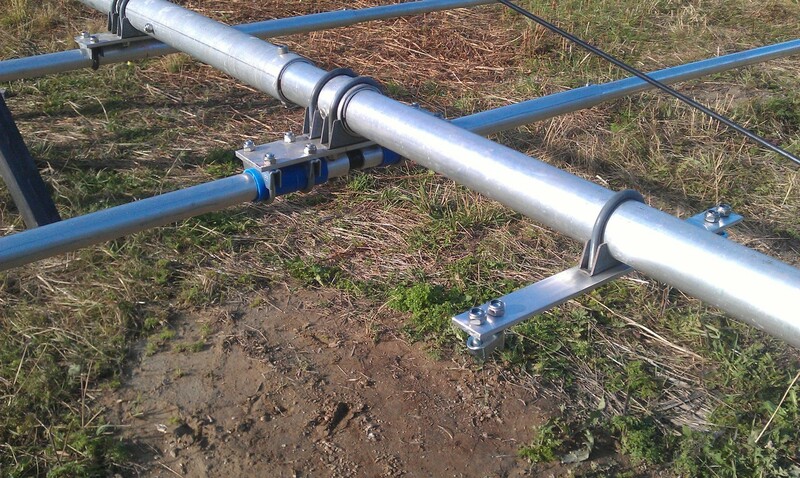 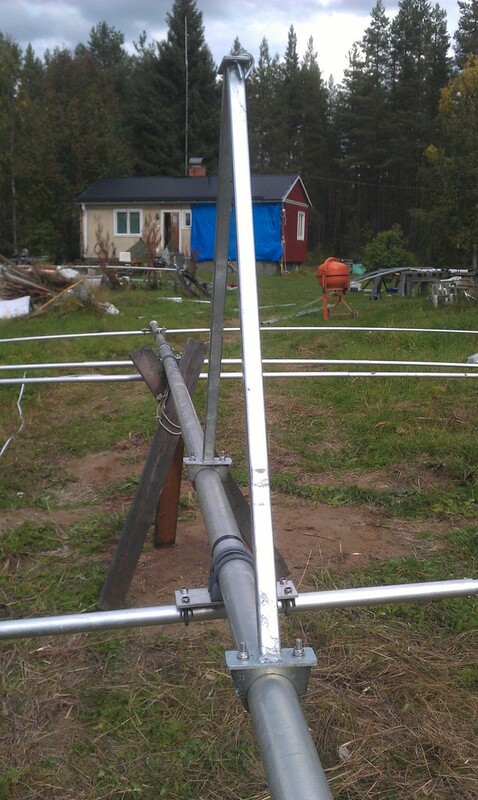 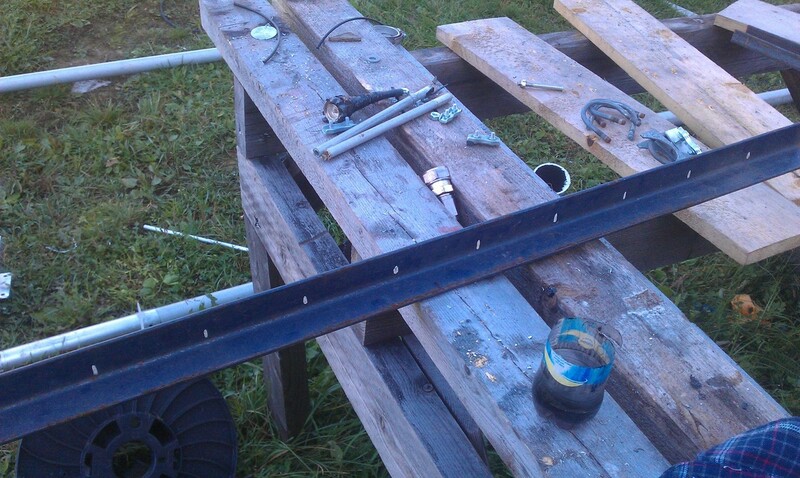 I am almost done with the top 20m yagi and the 40m elements are also done. 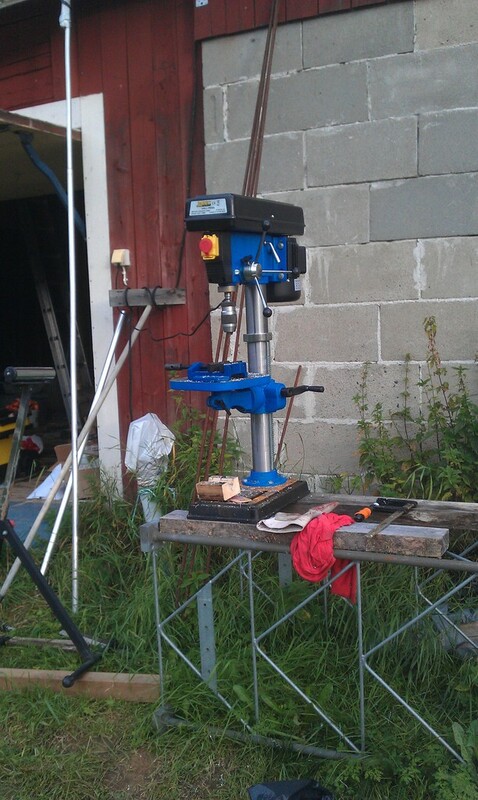 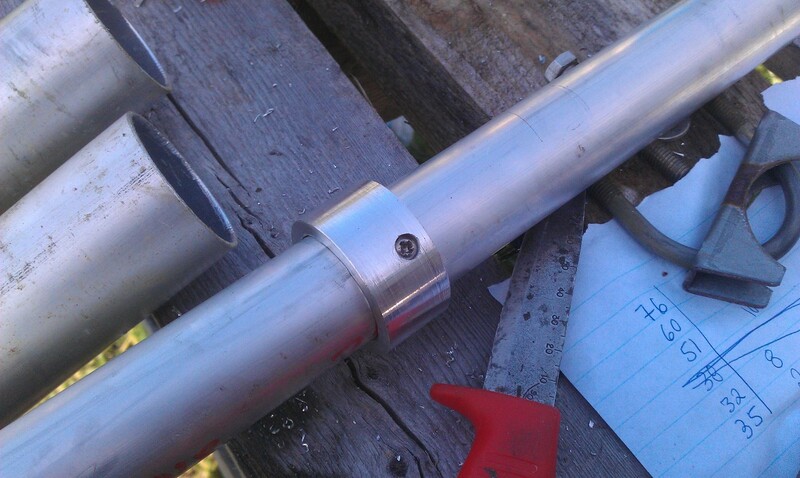 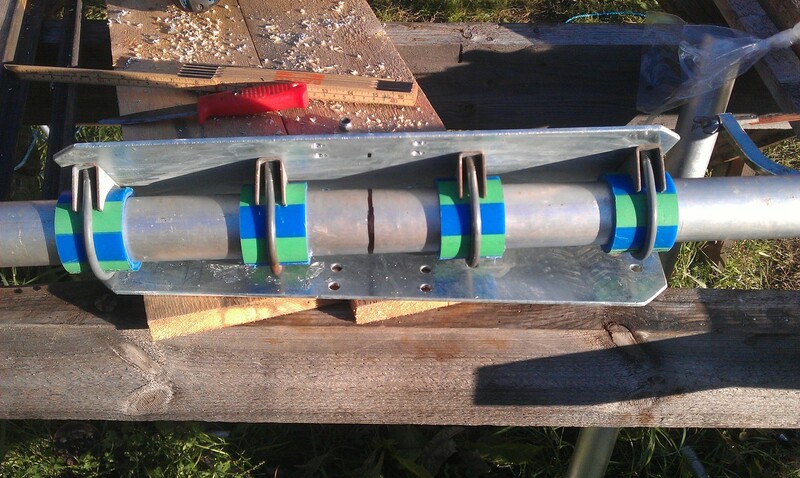 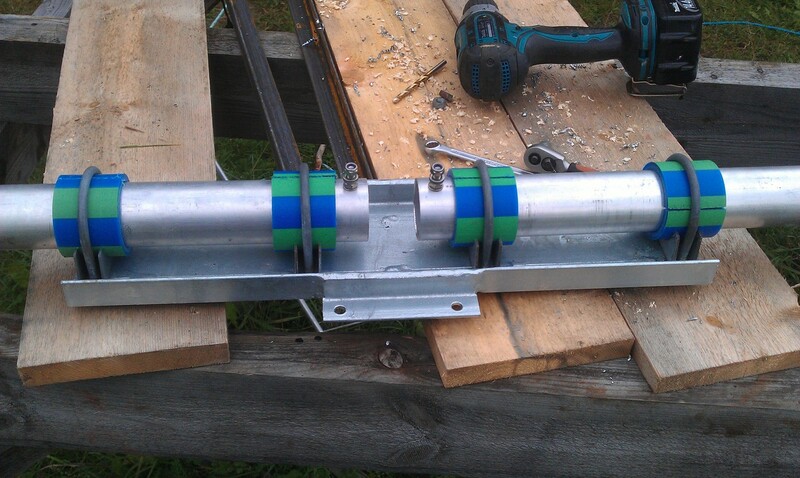 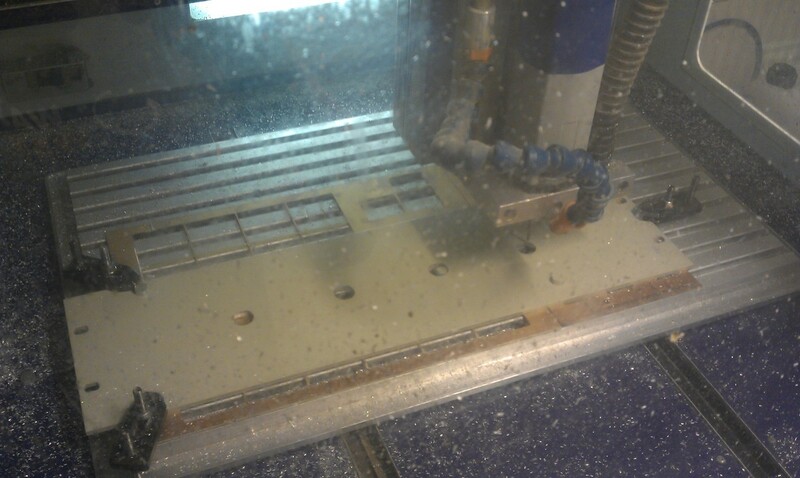 I need to get some 76mm clamps that I’ve ordered before I can continue with the 40m beams. 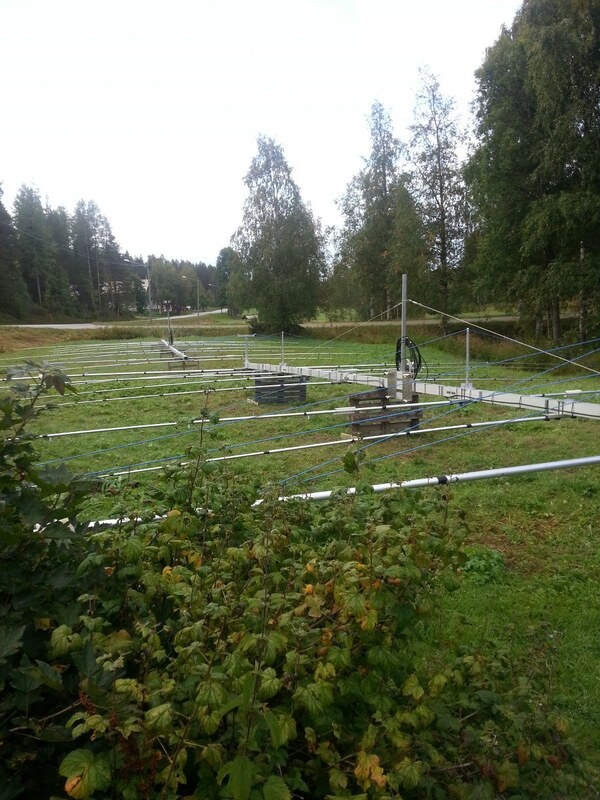 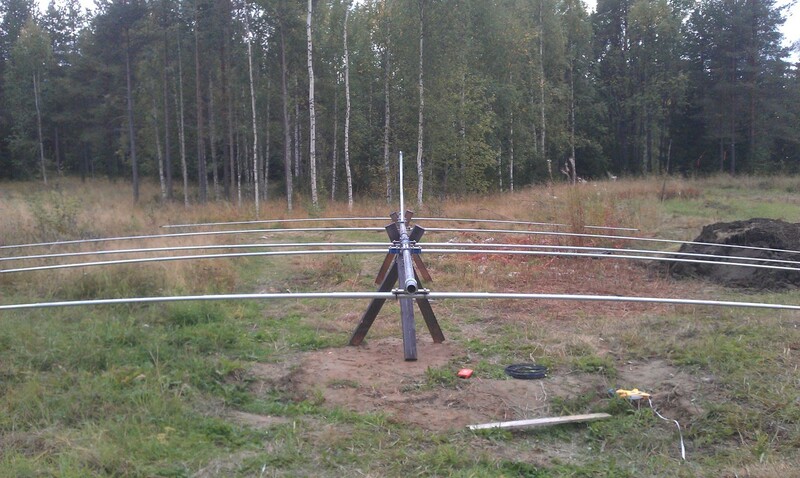 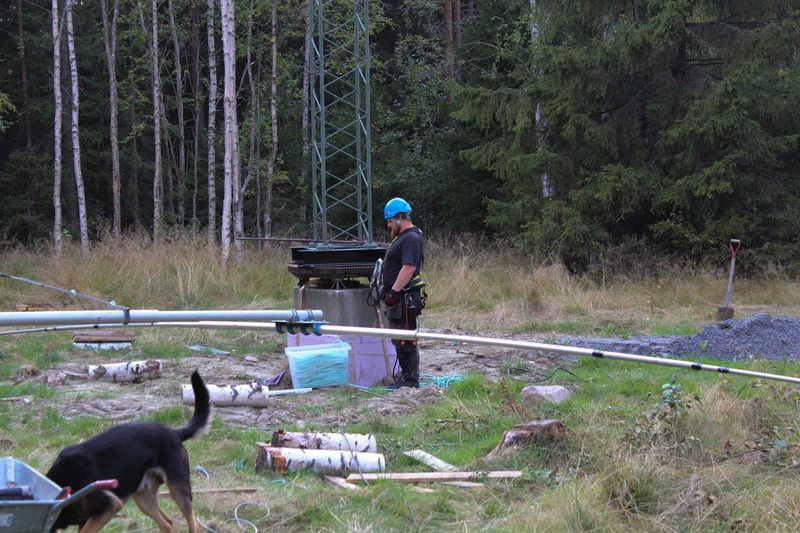 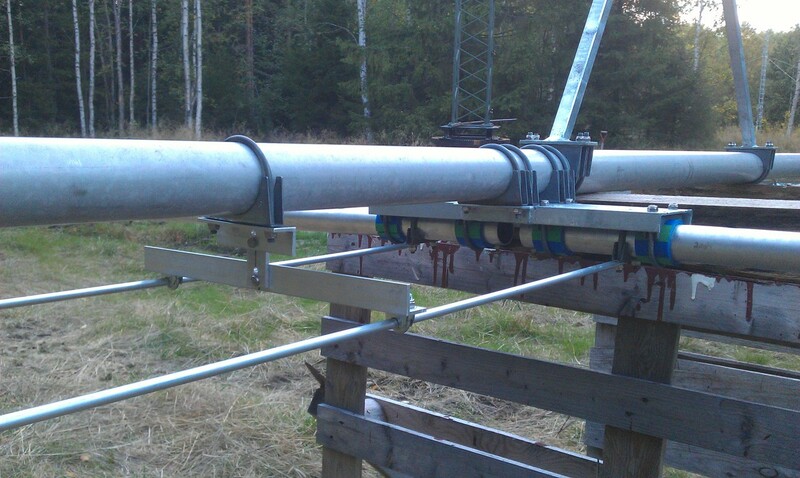 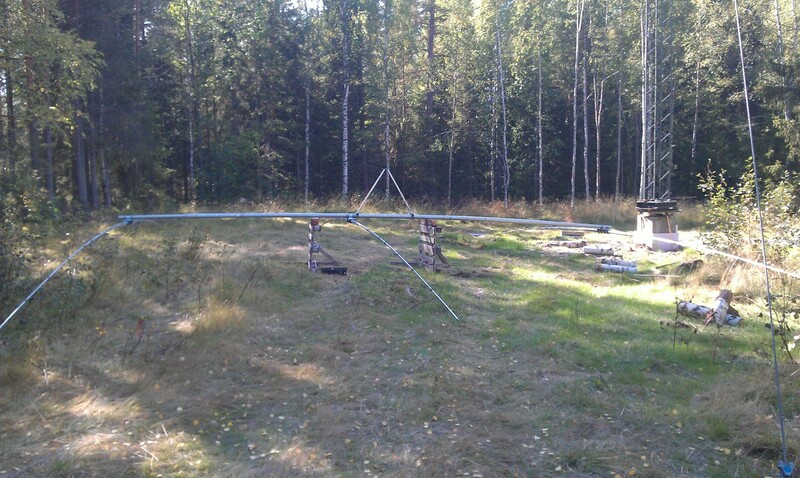 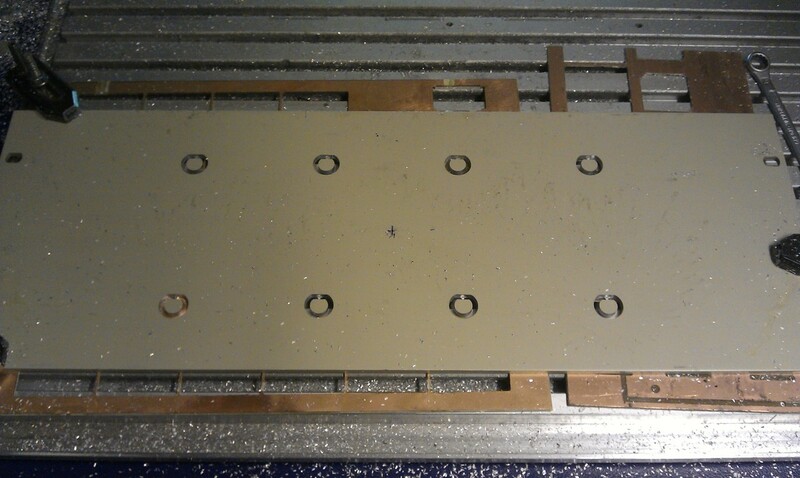 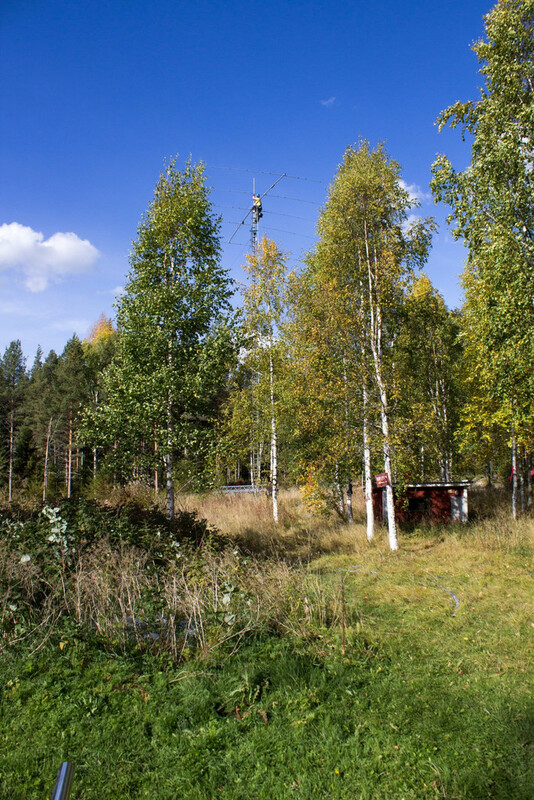 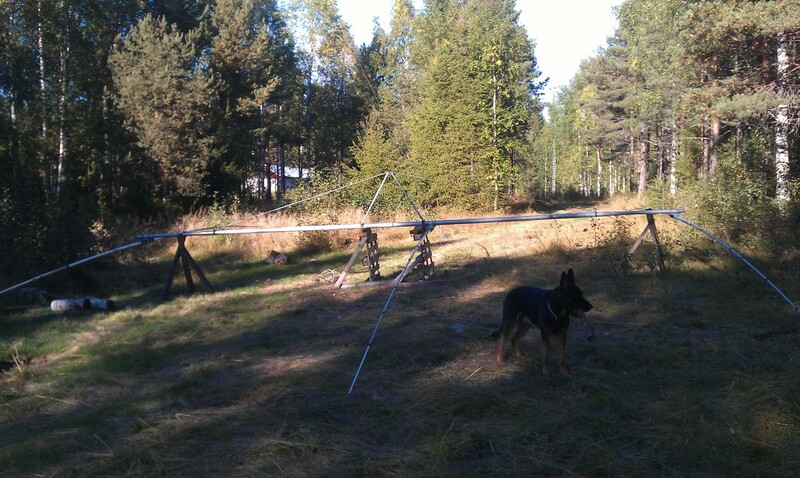 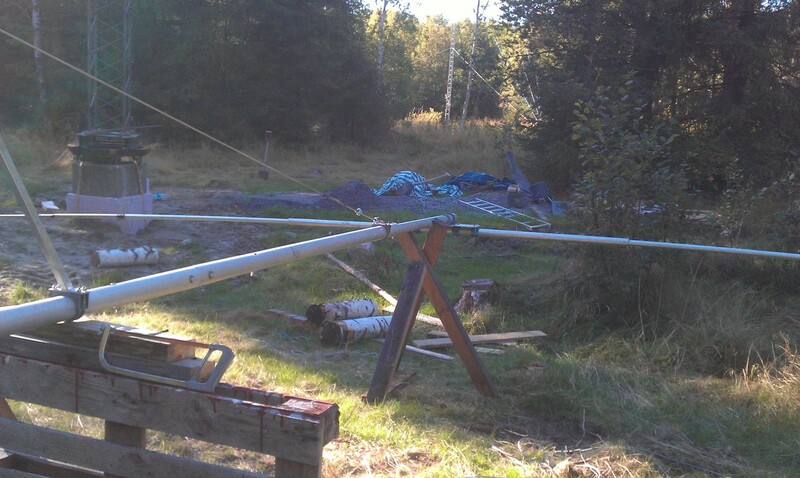 Tomorrow I will build the 3el for 30m which will be antenna #3 to go up. 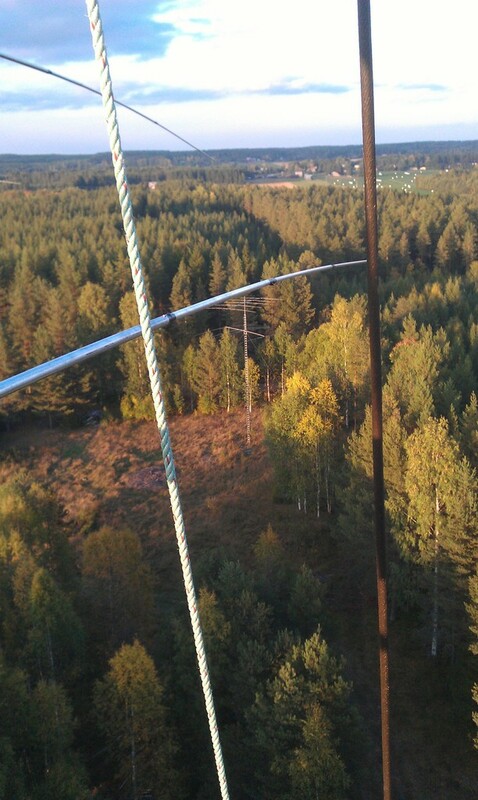 Maybe I’ll climb up with the tram wire and rope as well in the tower if I get some babysitting. 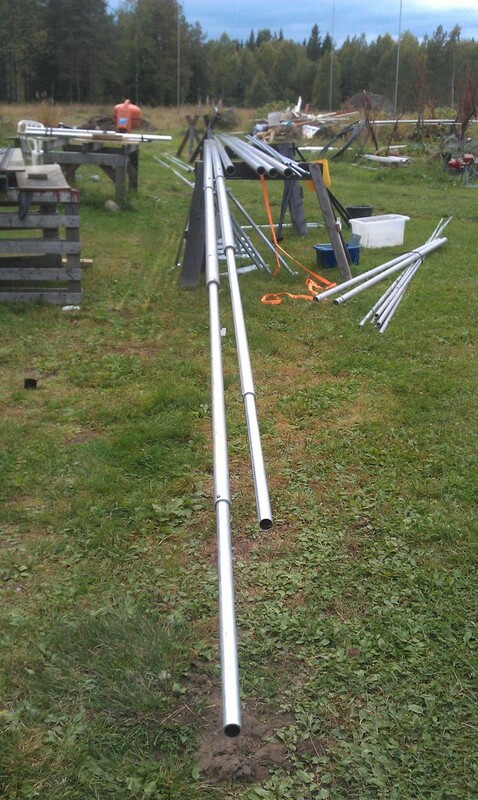 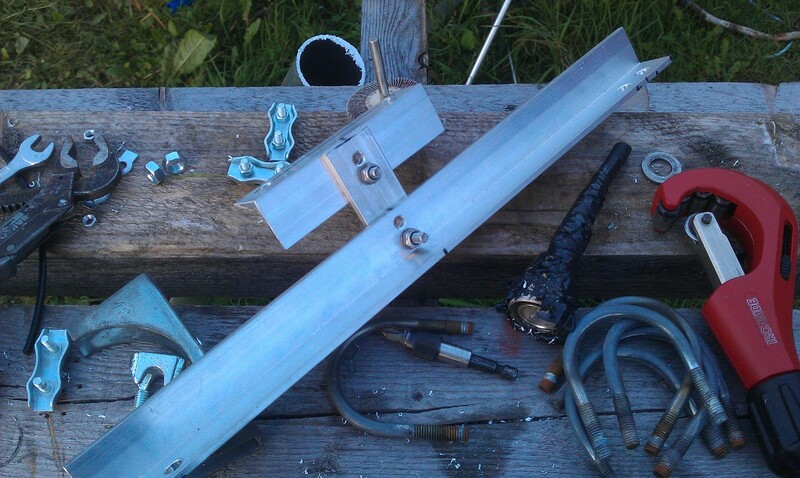 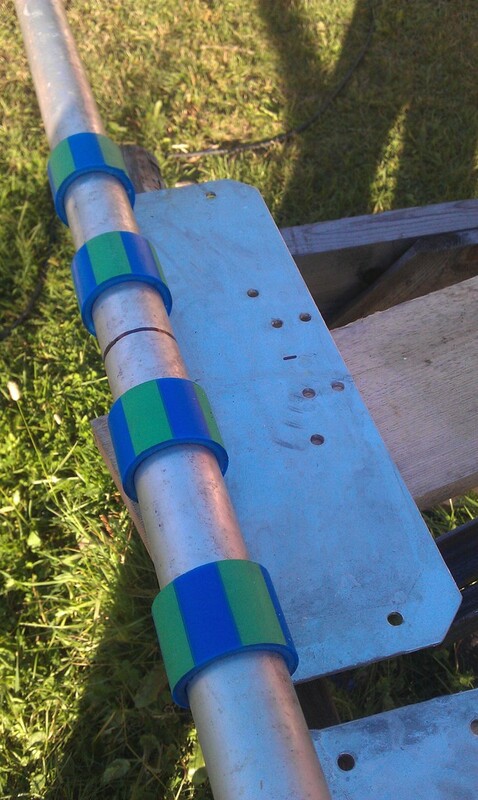 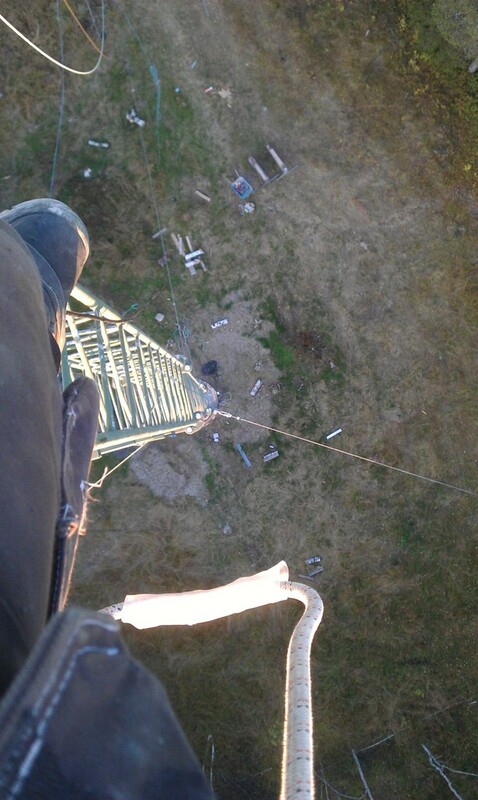 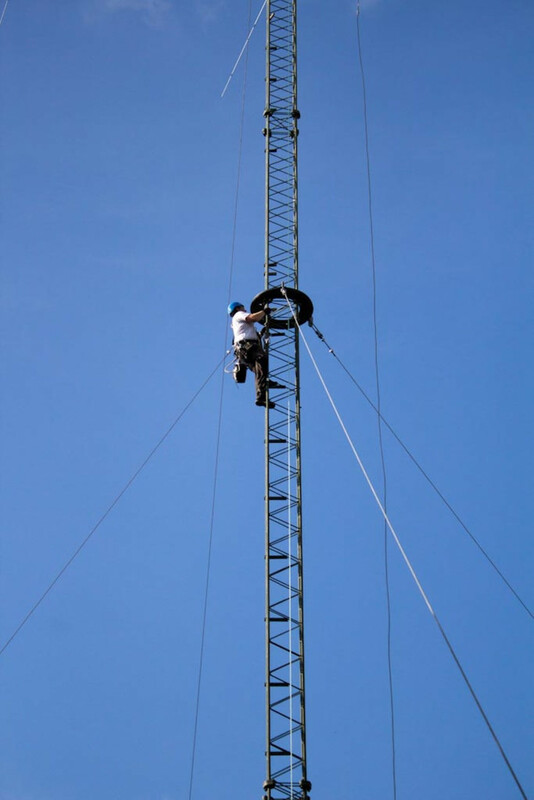 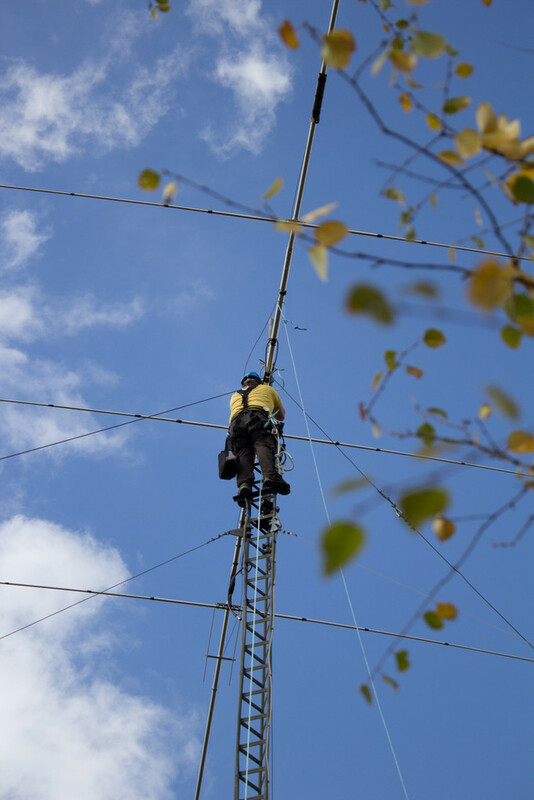 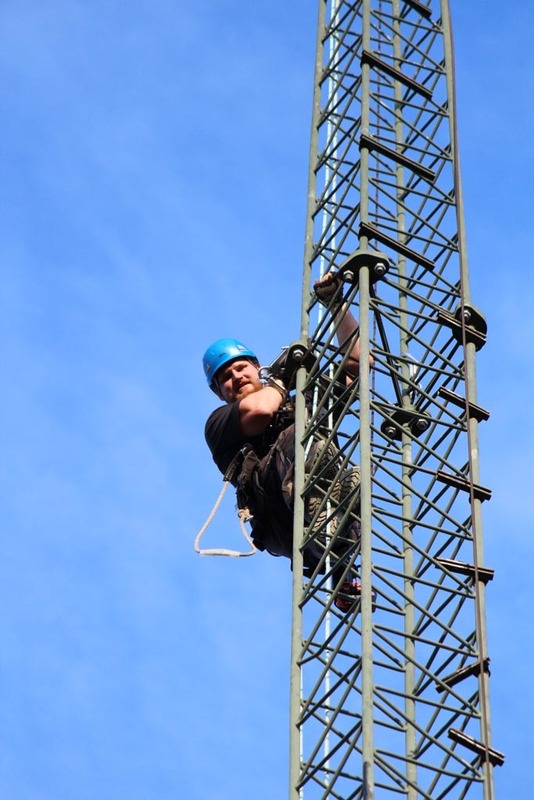 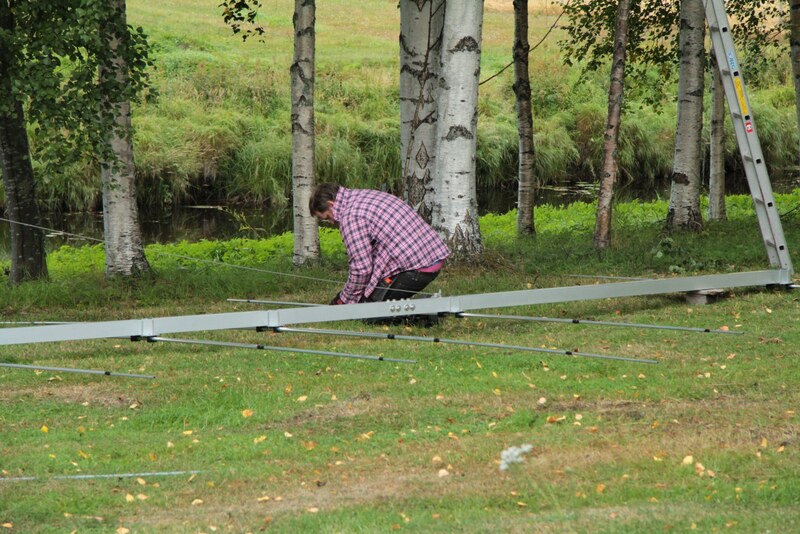 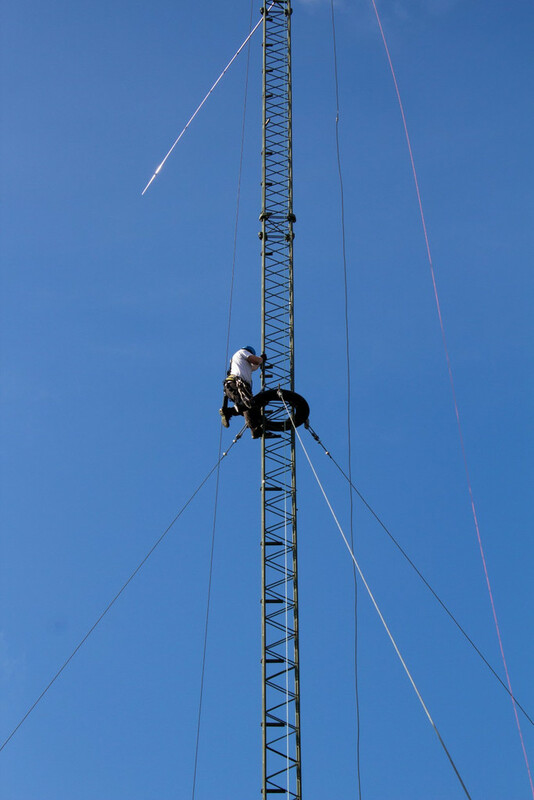 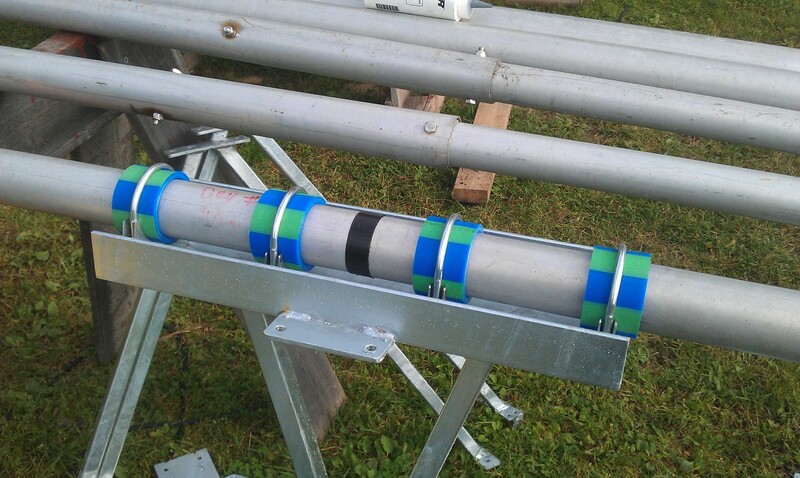 This weekend we headed down to SM2UVU to help out getting his home made tower put up and the Opti-beam antennas. 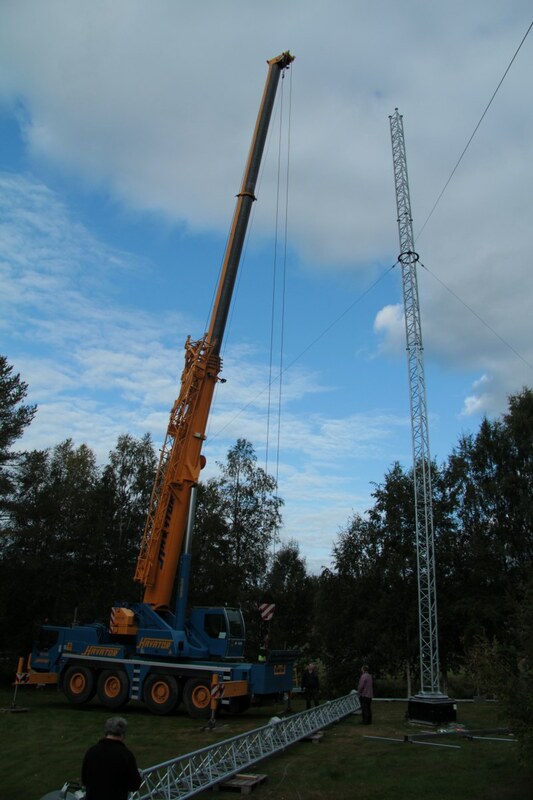 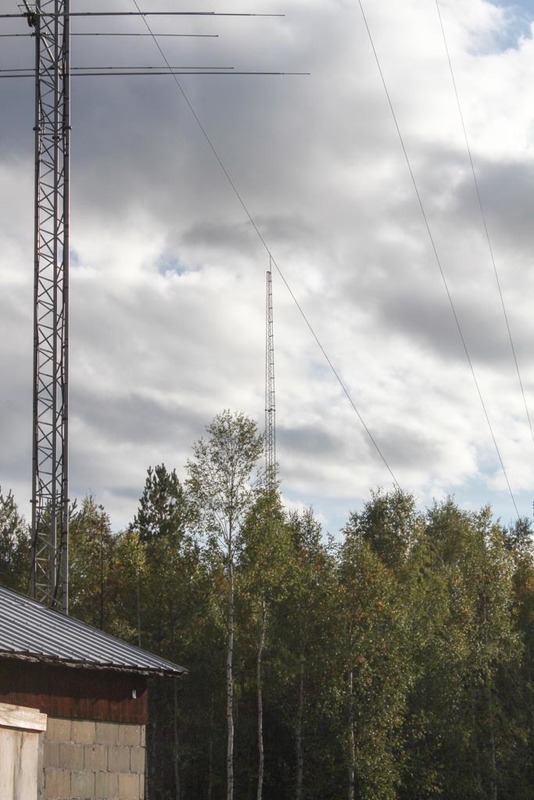 The station is now a beauty with the 46m rotating tower which holds a OB804020 in top which is a 2el on 80, 3el on 40 and 5el on 20. 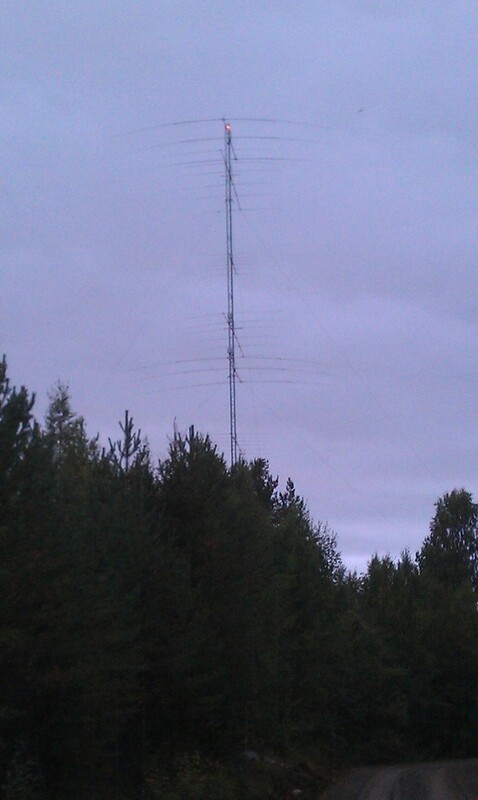 Below that he has a 2el for 30m, 5-5el 15/10 duobander, 3-5 40/20m duobander, 5el 12m, 5-5 15/10 duobander. 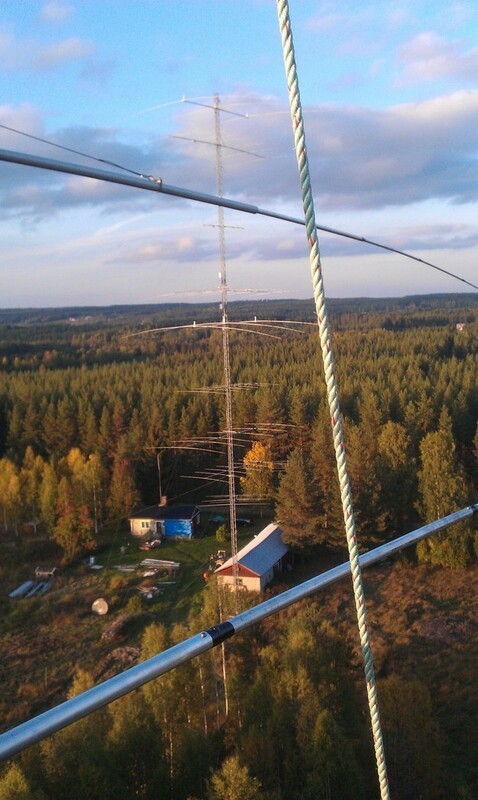 So it’s 2el on 80 @46m, 3/3el on 40, 5/5el on 20,15 and 10m plus a 5el on 12 and 2el on 30. 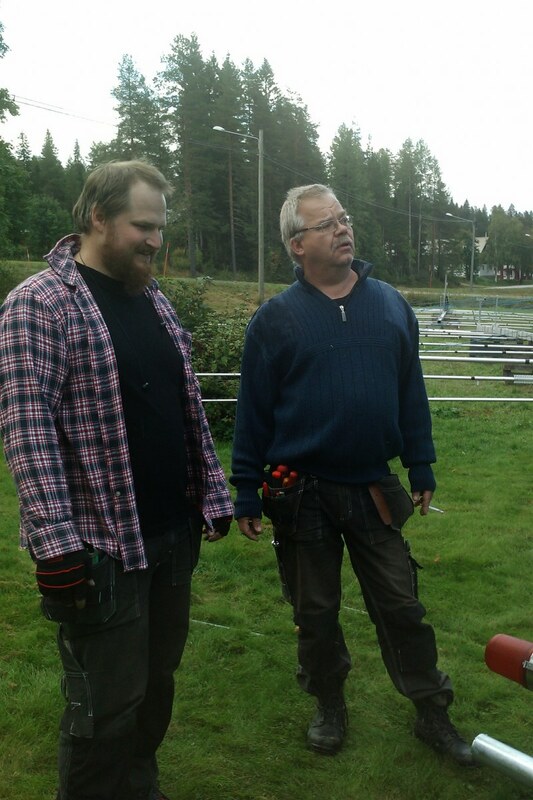 The work went really well. 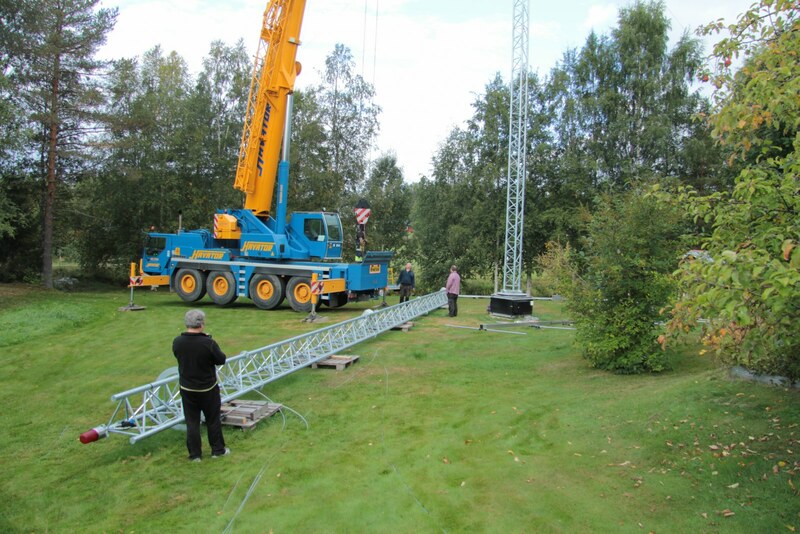 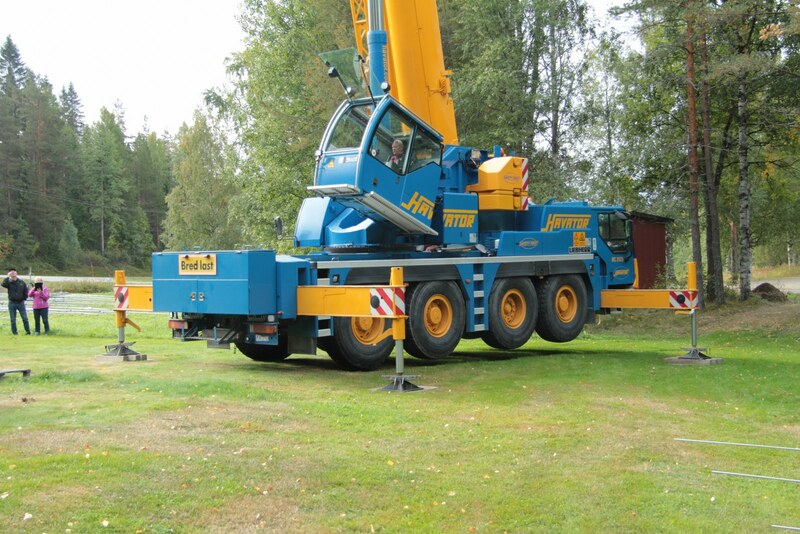 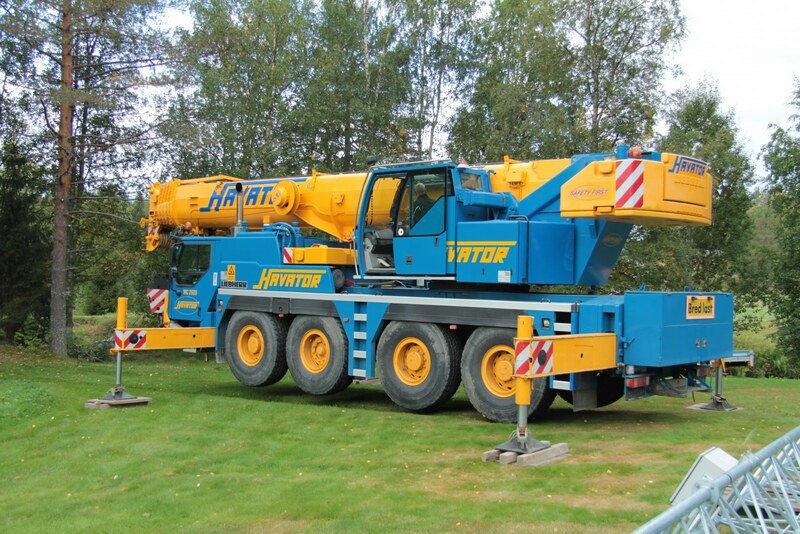 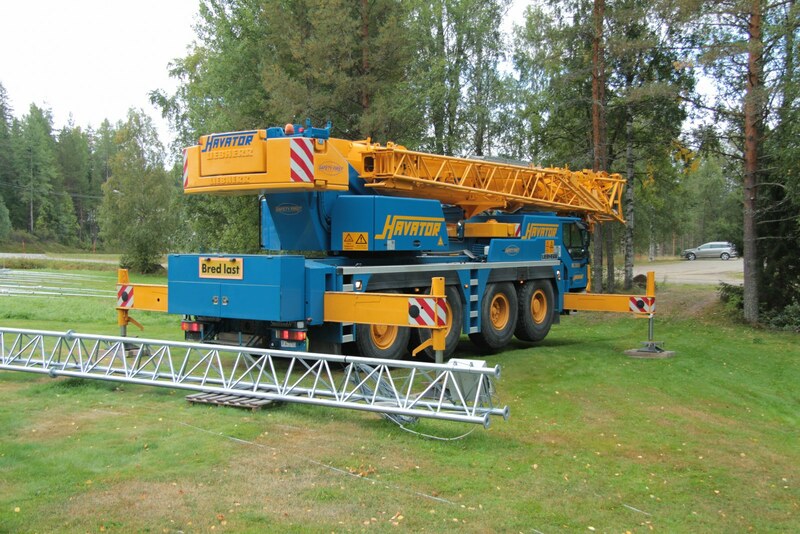 The crane arrived 08:00 and we were done 12:30. 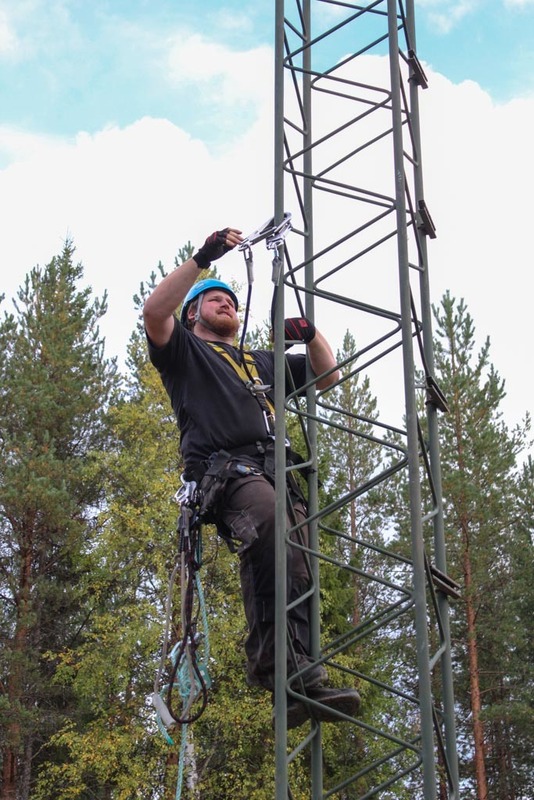 SM2NOG and me (SM2WMV/SJ2W) did the climbing and it was quite fun to be two people in the tower and made it a lot easier and faster. 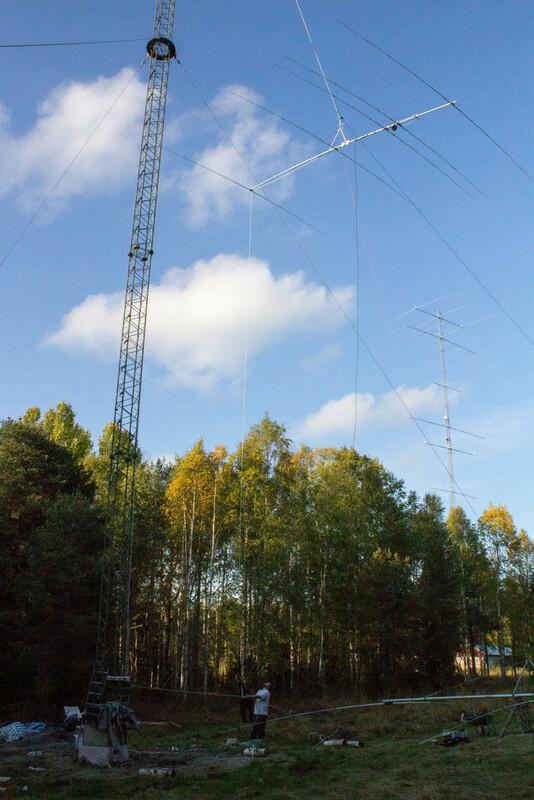 The rest of the crew were, SM2UVU, SM2VTS, SA2BRJ, SM2VJX, SM2LIY and SM2MZC. 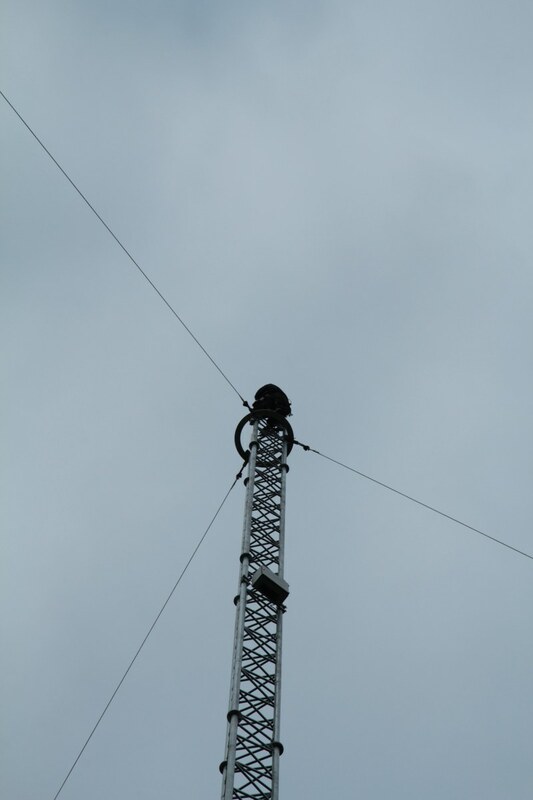 Pictures were taken by SM2VJX, SM2LIY, SM2WMV and SA2BRJ. 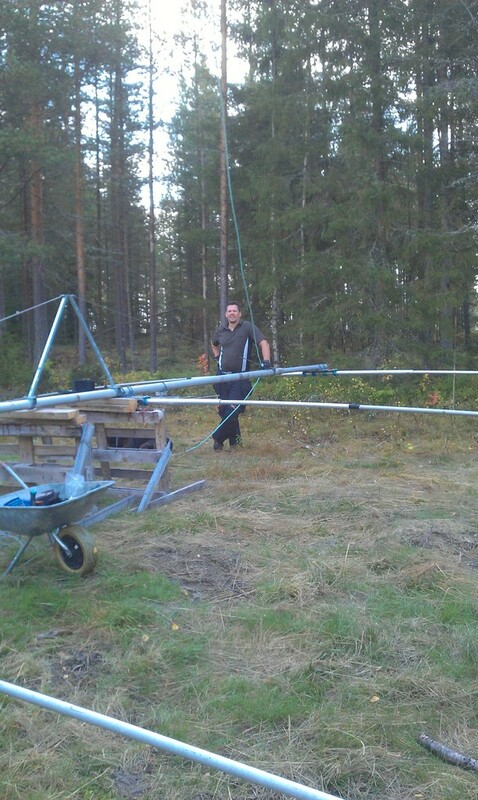 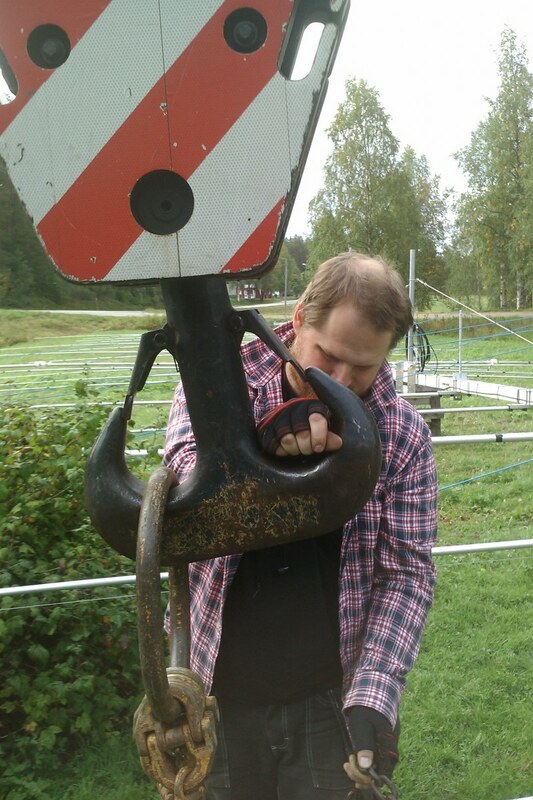 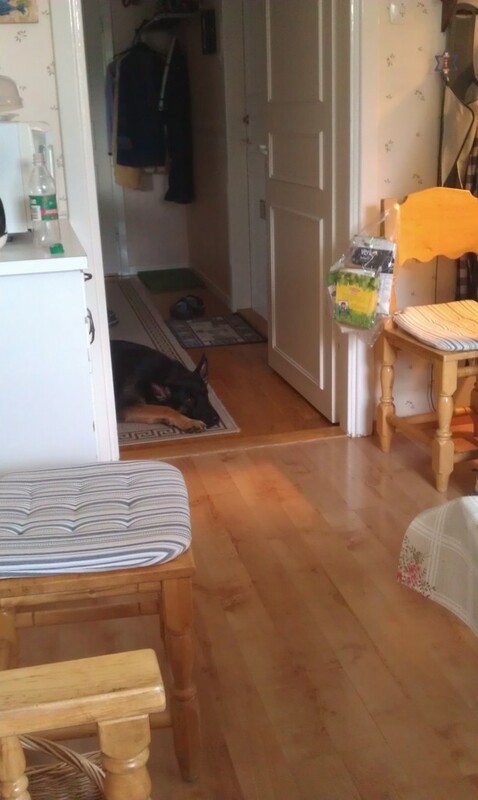 Now SM2UVU became a big-gun but hopefully he will join us at SJ2W during most of our M/S efforts.